Recently 1406 (Spalding) Squadron enrolled 19 new cadets into the Air Training Corps. They all made their cadet promise, received their bibles, and their 3822s. They are now full members of the SQN and the Corps, best of luck to all of them with their future at the Squadron and in the ATC. Sergerant Beki Navarrete (RAFAC) and Mr David Wait took the opportunity to talk about the previous year at the Squadron and what is planned for the rest of 2019. The cadet Non Commissioned Officers took the stage to talk about the achievements from 2018, what the cadets have done, and what we are looking to achieve in 2019. Certificates of Appreciation, Civillian Committee Member Nikki Hope, Civilllian Committee Member Louise Embleton, Civillian Committee Treasurer Clare Hunns, and Sargeant Navarrete (RAFAC). Outstanding Achievement, Cadet Warrant Officer Jordan Bertolaso. Squadron Leader Bond (RAF) then took the time to deliver a short speech about the Air Cadets, and thanked the staff for all their dedication. The evening ended with a rousing speech from Air Commodore Terry Jones (Royal Air Force). It was a wonderful evening and well done for everyone who won an award. We would also like to thank RAF Wittering for sending Sqn Ldr Bond & thank Air Cdre Jones for his speech. Put it on your calendars, bring a friend! We’d like to invite you if you are between 12 and 17 and interested in joining Air Cadets to our Squadron Open Evening! Spalding Squadron is now recruiting potential cadets for our next intake. 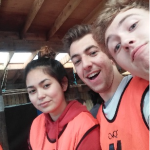 If you want to be doing more with your evenings and weekends, taking part in a number of fun activities you wouldn’t be able to do elsewhere then feel free to come down and see what we’re about! Where: Our HQ at the ACF/ATC Centre, Castle Sports Complex, Pinchbeck Road, Spalding opposite the Castle Sports Complex Swimming Pool. Who: If you are between 12 and 17 years of age – please bring a parent or guardian with you on the evening. Anything else? Potential recruits should wear school uniform on the evening . 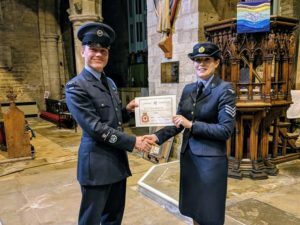 Cadet Emily Hampson (17) 1406 Spalding Squadron Royal Air Force Air Cadets (RAFAC), was recently promoted to Corporal, this is how she did it. 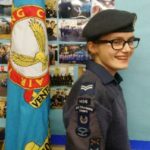 Emily volunteered herself for many squadron activities such as bag packs, went on a Method of Instructor Course, attend regularly on parade nights and kept her uniform to a very high standard. Emily has also acheived many badges from Pre Duke of edinburgh, Bronze Cyber, Bronze Communication Badge, Blue Leadership Badge, Master Cadet and Bronze First Aid Badge. She is looking forward to helping with the running of the squadron Flight Simulator as well as other aerospace projects within the squadron. 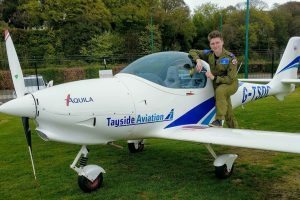 Cadet Warrant Officer Jordan Bertolaso (19), recently returned from Tayside Aviation in Dundee where he successfully completed the Air Cadet Pilot Scheme, a 12hr flying scholarship, applied for through the squadron. 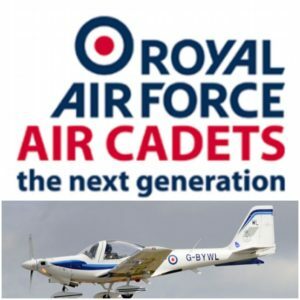 The Air Cadet Pilot Scheme is open up to over 40,000 cadets, with 186 places per year, 30 places are split evenly across the Beds & Cambs Region. To apply for the scheme you must be 16 years old with a good interest in aviation. The course provides twelve hours flying in the Aquila A211 aircraft shown in the picture, with the end goal to be the cadet flying solo. Students must learn the principles of flight, aircraft controls, recovering from stalls, circuits and theory as part of the ground school part of the course. 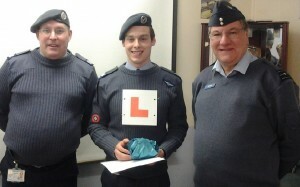 CWO Bertolaso was one out of the four that passed on his course. CWO Bertolaso was assessed and flew to a solo, earning him the Corps coveted Gold Wings, which he can now proudly display on his uniform. CWO Bertolaso said “The course itself is a once-in-a-lifetime experience. Whilst the flying was of course the greatest aspect of the course, the opportunity to meet people from all of the Corps was amazing. I highly recommend the course to any other cadet”. Put it into your calendars, bring a friend! We’d like to invite you if you are between 13 and 17 and interested in joining Air Cadets to our Squadron Open Evening! Who: If you are between 13 and 17 years of age – please bring a parent or guardian with you on the evening. Anything else? Potential recruits should wear school uniform on the evening. Spalding Air Training Squadron is celebrating a first in recent history at the same time, grouped together for the picture we have the three possible lanyards achievable in the Corps awarded to Cadet Sergeant Jordan Bertolaso (18) left, Cadet Sergeant Amber Wait (17) middle, and Cadet Sergeant William Chew (18) right. The highly prized awards of Instructor Cadet (yellow), Junior Leader (purple) and Qualified Aerospace Instructor Cadet (QAIC – blue) all symbolize the hard work and effort put in by the cadets to be granted permission to wear the lanyards and instruct fellow cadets in specialized subjects. The Squadron is very proud, each of the cadet Sergeants has shown commitment in passing selection processes to get on courses, completing all the work needed (in one case a number of years), being assessed and passing each stage needed, they have become fine examples to follow. Cadet Sergeant Jordan Bertolaso commented ” QAIC is the best, cannot recommend it enough”. Cadet Sergeant Amber Wait commented “It was a great learning experience, and it has broadened my horizons”. 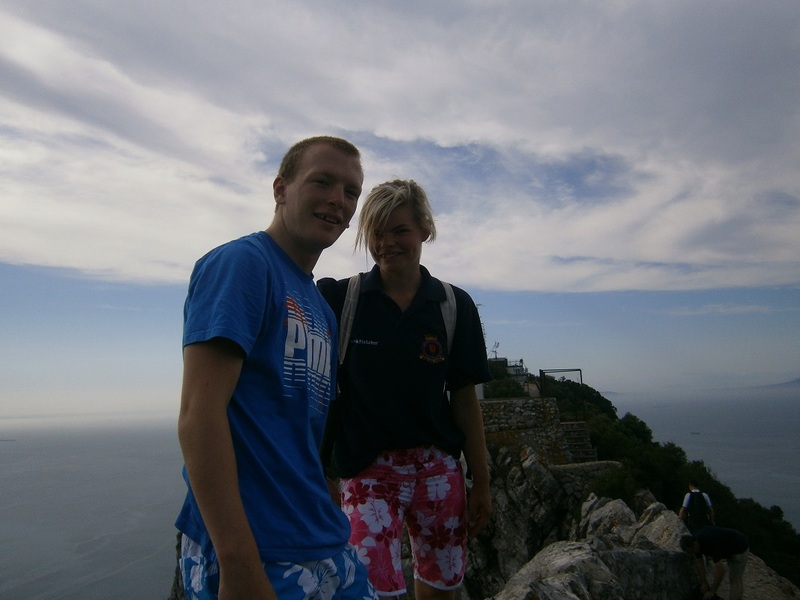 Cadet Sergeant William Chew Commented “The hardest, yet most worthwhile achievement”. 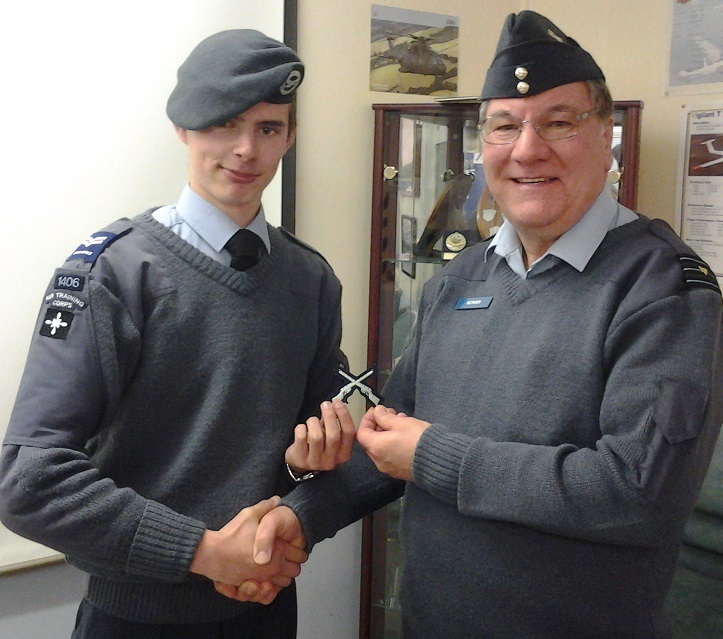 Cadet Sergeant Jordan Bertolaso (18) is only the second 1406 Sqn NCO to be presented the highly-prized blue lanyard of the Qualified Aerospace Instructors Course (QAIC), which is notoriously difficult to get chosen for, let alone pass. He was selected from more than 300 applications to take part in the course. Once selected he travelled to RAF Linton-on-Ouse, near York once a month for intensive working weekends, starting in September through to March, he built on his knowledge and developed skills to teach others. In April he was tested, including researching and creating a 40 minute presentation based around Remotely Piloted Aircraft Systems, which was selected as one of the top four from the whole course. Jordon will now assist in the running of regional aviation courses, help at Aerospace Camp and possibly at future QAI courses. As part of the course he also completed an Institute of Leadership and Management (ILM) Level 2 qualification in teamwork. Cadet Sergeant William Chew (18) has successfully completed the Junior Leaders Course and passed out on Thursday 20 April. Something the Sqn has not seen a cadet do in the last 10 years at least! The Junior Leaders Course is famous for being one of the hardest course for the cadet world to get on to and pass. 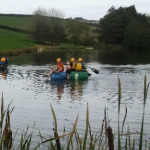 The course selection weekend in this case was at the start of September 2016 and then the course consisted of 8 training weekends, one a month at various bases and training areas around the country every month until the end of March 2017. 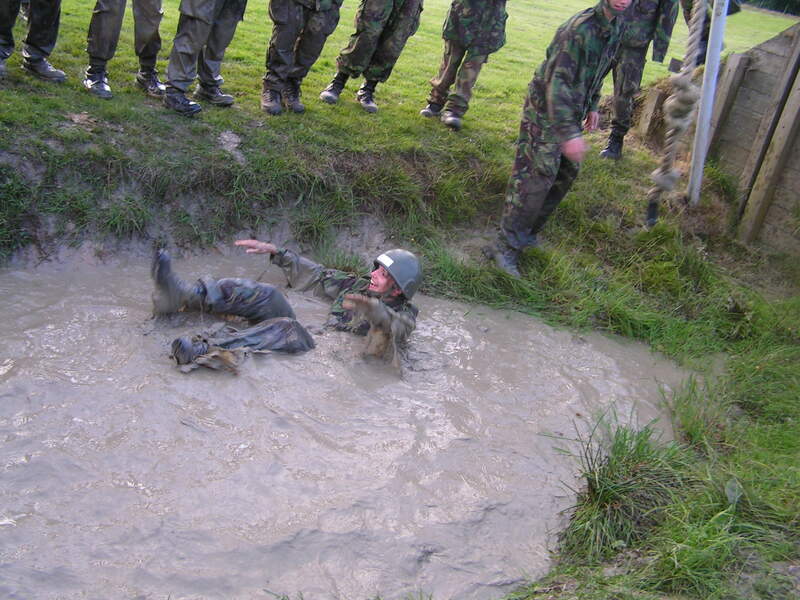 The training course all accumulates into a single test week which the prospective Junior Leaders spend 7 days in the field, being testing for leadership and field-craft skill with various patrols and tasks every day. The course selection found 127 cadets being accepted out of hundreds of applicants onto a selection weekend to compete for 80 places on the course. Out of the 80 who started the course there was only 52 who made it to graduation dinner. By using field-craft the course really test the young persons leadership skills like nothing else the Corps has to offer. Alongside the course the cadets complete an Institute of Leadership and Management (ILM) Level 3 qualification which is highly respected qualification. The end of the course was very special for each successful cadet as they put on dress number 1’s (our best uniform) along with their newly awarded “Maroon shoulder lanyard” and are treated to a graduation dinner in RAF Honnington’s Officers Mess with the Air Commandant Dawn McCafferty. 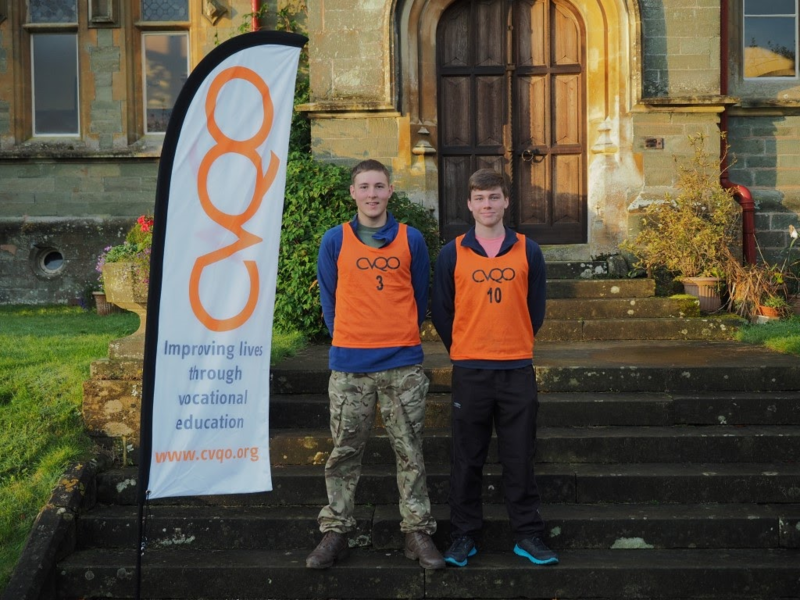 During the half term two of the squadrons cadets, Cadet Flight Sergeant Avery and Cadet Sergeant Bertolaso, travelled down to Somerset for a week long course run by CVQO. It was a course for a Level 3 ILM in Leadership and Management offered by ILM. Cadets from all the corps, from wherever in the country can apply and 64 were given places on the course. They left Spalding at 0700 on the Monday and travelled for several hours to get to Somerset for 1230. Once everyone had arrived they were taken to Quantock Lodge which would be their home for the rest of the week. On the monday evening the course was split into 8 teams of 8, then they spent the afternoon meeting their new team members. On the Tuesday after breakfast we were driven down to Lydeard Farm, where they received a theory lesson before heading out to the farm and putting the theory into practice. In the evenings they worked on filling out their booklets. The Wednesday was similar to the Tuesday, except half of each team would lead a 1hr 15min command task. SGT Bertolaso had to lead his team to assemble and fire a medieval trebuchet and FS Avery lead his team in building a bridge over some very muddy water. On the Thursday the other halves of the team lead their tasks. Friday morning all the cadets packed their bags and then headed over to the lodge where they worked on finishing their booklets. The booklets were then submitted to CVQO to be assessed and the cadets are now awaiting the news to see if they have passed. 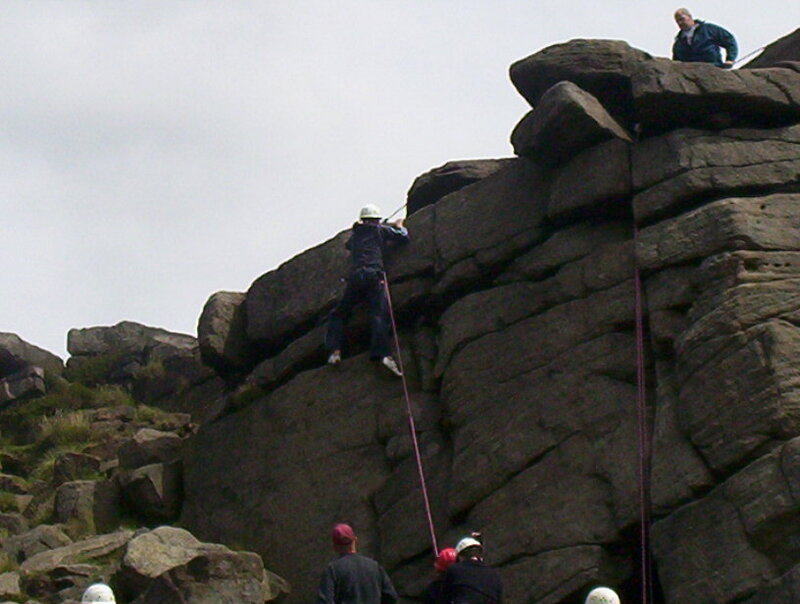 Overall the course has allowed for them to learn new skills and develop their current skills. These skills can be passed onto the cadets and we can help develop everyone at the squadron. 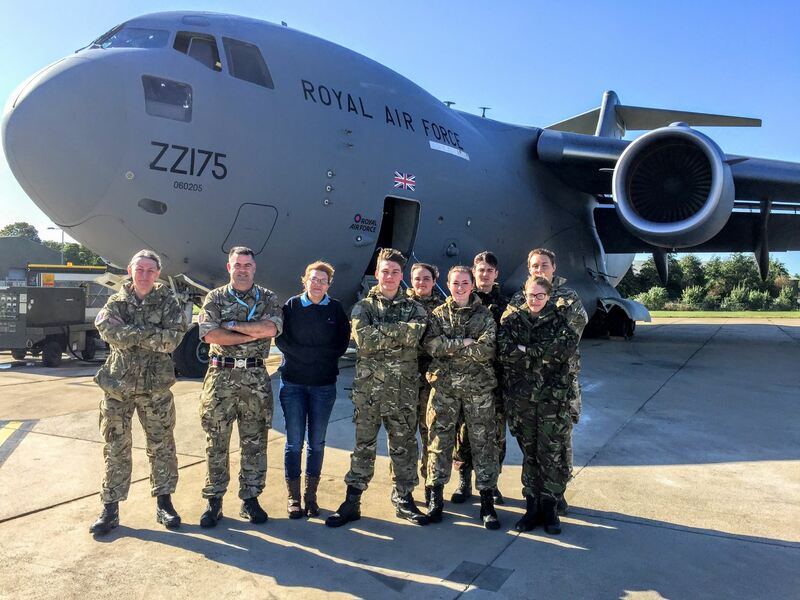 This week 6 cadets and 3 staff travelled to RAF Brize Norton for a visit to 99 Squadron, Royal Air Force. 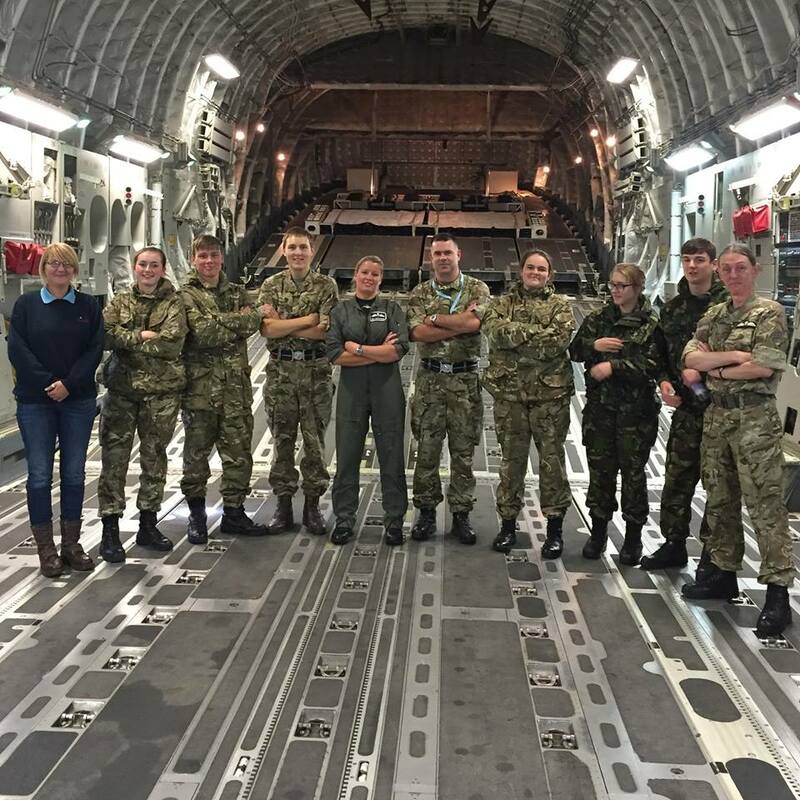 They were privileged enough to get a flight aboard the C-17 Globemaster III, then enjoyed the day very much, an event that they will not be forgetting anytime soon. 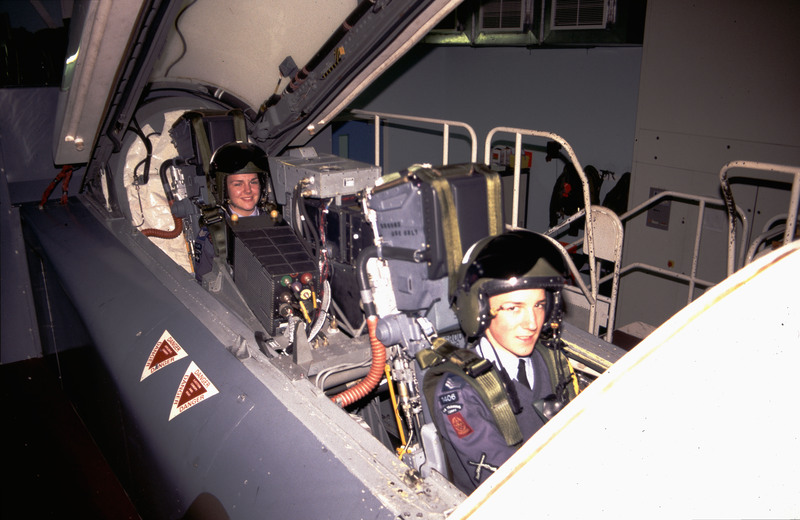 The flight lasted around 3 hours and all the cadets had a chance to experience a take-off and a landing from within the cockpit. Not only that but everyone had a chance to walk out on to the rear ramp whilst being 12,000ft above Wales. The experience was a once in a lifetime opportunity for the cadets and they took many pictures and videos to remember the day. 1406 would like to thank all the staff, both at 99 Squadron and at RAF Brize Norton for giving us such a great opportunity. The cadets will be talking about this day for years to come. Three cadets of 1406 Squadron Air Training Corps (ATC) recently took part in the National ATC First Aid Championships over the weekend of the 29/30 Oct at Beckenham Camp and RAF College Cranwell. Cadet Flight Sergeant Jordan Avery and Fg Off Jessica Constance Bradshaw competed as a Wing team won the Young Adult Competition and can now proudly call themselves the ATC National Champions. Our Youth team of Cdt Corey Genovese, Cpl Aimee Halfpenny, Cpl Amber Wait and Cpl Cameron McGeown competing in their first National ATC Championships were a creditable 4th overall as a team, and surpassing all expectations Cdt Corey Genovese achieved a remarkable individual 3rd Place. The casualties were also commended on their acting skills, the Squadron provided two of the casualties in the guise of Cadet Flight Sergeant Becca Risebrow and Cadet Sergeant Jordan Bertolaso. Several cadets of 1406 Squadron Air Training Corps (ATC) went as part of the Beds and Cambs Wing to compete in the Region First Aid competition held at 5F Northampton Sqn, this was due to a last minute change of venue from RAF Wittering due to unforeseen circumstances. 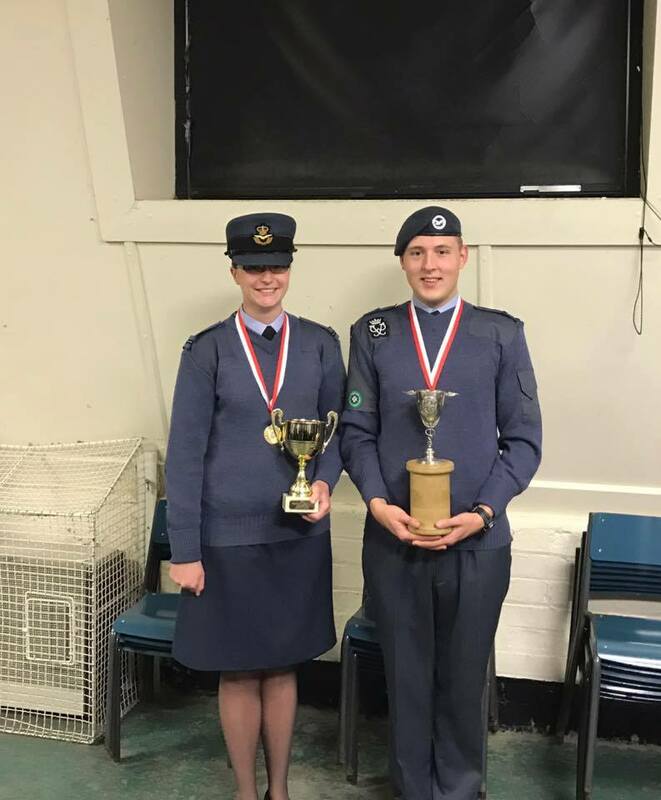 It is with great pleasure and enormous pride that we can report the Young Adult Team of Fg Off Jess Bradshaw, 2331 Sqn and Cadet Flight Sergeant Jordan Avery 1406 Sqn won a hard fought competition and came first for their age competition. 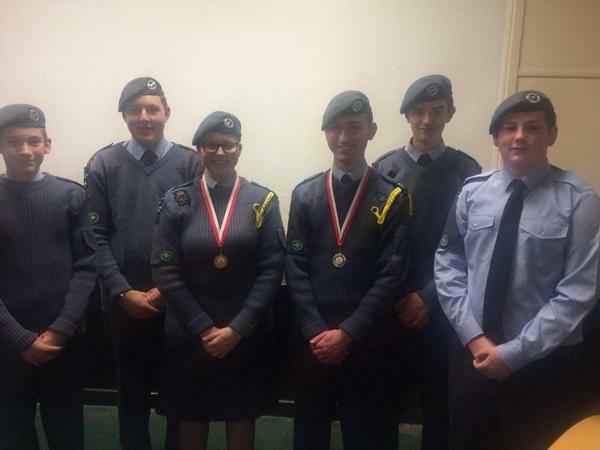 The Youth team of Cdt Corey-John Genovese, Cpl Cameron McGeown, Cpl Amber Wait and Cpl Aimee Halfpenny all from 1406 Sqn came a very close but commendable second place in their age event. Due to the fantastic efforts of both teams, they all now go on to represent the Region at the National ATC First Aid competition to be held at Cranwell in late October this year. FS Jordan Avery (17 yrs) completed the Nijmegen 100th Anniversary March as part of the “Pathfinder” 40km team (civilian under 18). 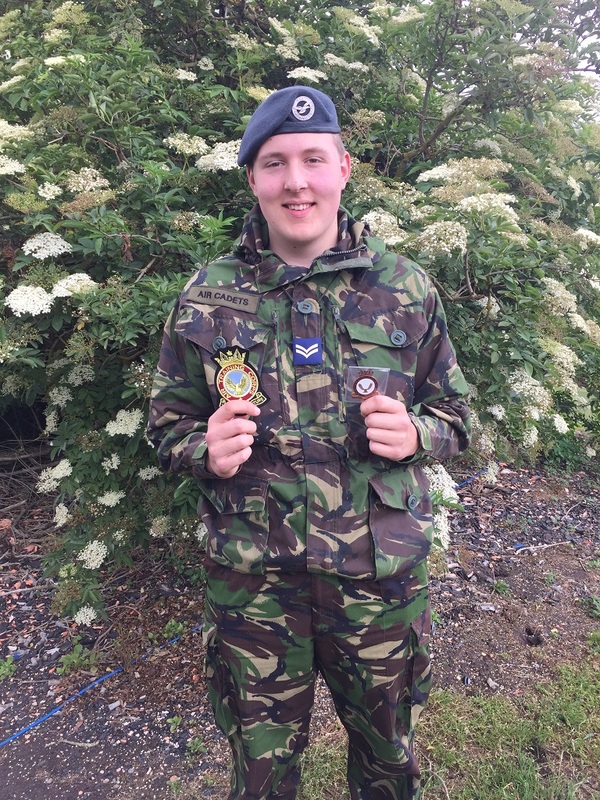 He was selected for the team having completed 10 training marches based at RAF Wyton. Although FS Avery didn’t suffer from any injuries, however there was a 10% overall drop out from the 48,000 that started. So we are happy to congratulate him on completing the march and especially during its centenary. The cadets of 1406 Squadron Air Training Corps (ATC) recently participated in the Bedfordshire and Cambridgeshire Wing Field Competition, this annual event sees thirty squadrons in the wing participate in a full weekend of competitions from Aircraft Recognition, Team Leadership Exercises, Music to Drill. 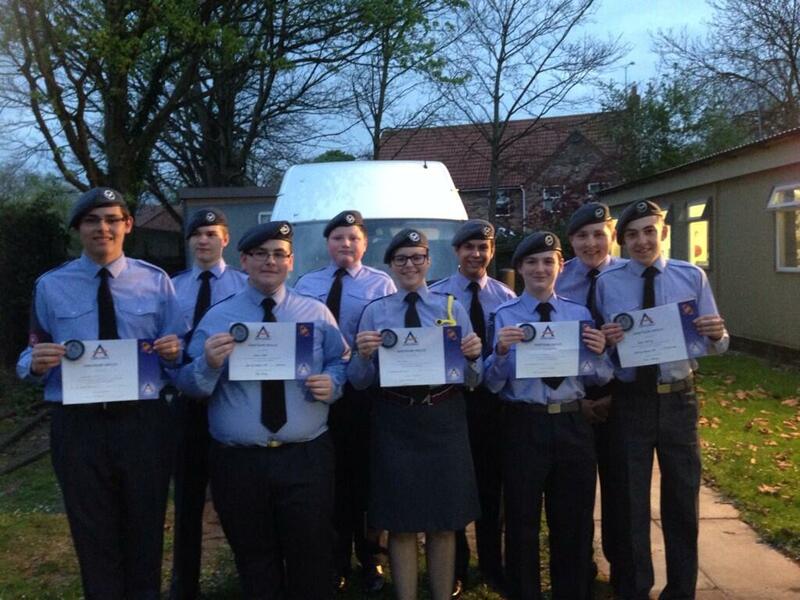 This year the Spalding squadron placed 12th overall, its highest result in the last 5 years, partly resulting from the Young Adult First Aid Team winning for the third year in a row and the Youth Team winning for the second time in the last three years. 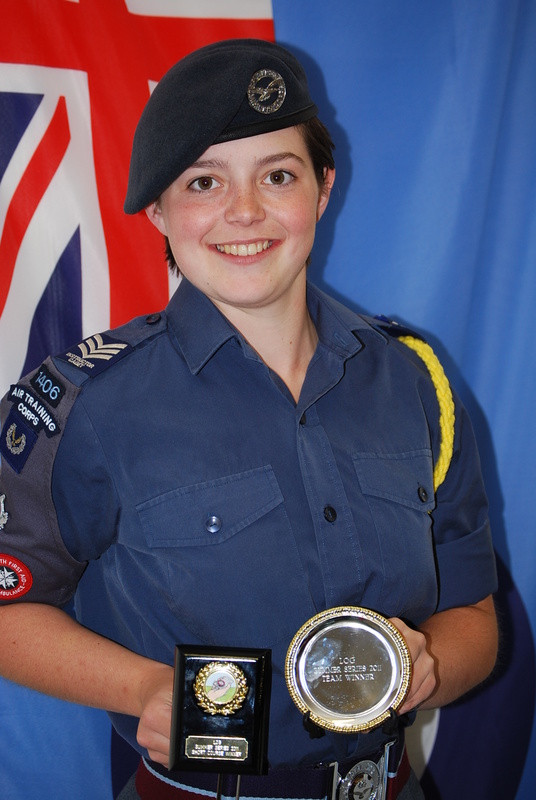 A nice surprise was new Adult Sgt Maria Lockie also being awarded the Wing Commander Bower Award for her time and dedication as a Cadet Warrant Officer. 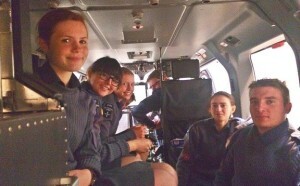 Overall it was a great weekend and the cadets all had fun with lots of smiling faces. Sunday 3rd July 2016 saw an Armed Forces Celebration Day at the Anglia Motel, Fleet Hargate, 11-4 pm. Tulip Radio working in conjunction with the Ministry of Defence to celebrate the lives and continued work with our local Veterans and Armed Force personnel and their families. Tulip Radio contacted Veterans who had not yet received their Ministry of Defence Armed Forces Veterans Badge and to qualify for this the Veterans had to have served in the Armed Forces at some time in the last 70 years. Those who did were presented with a unique badge and received a special Certificate from Rt. Hon. John Hayes MP at the beginning of the event and Ross Dean conducted a service of remembrance honouring those who had fallen in battle. There was a buffet provided by Harold and cream cakes provided by Terry Moore from Bakkavor, all kindly served up by Terry and the Cadets of 1406 Sqn ATC. The Cadets helped look after the Veterans and be a part of the event. Cadets, staff, civilian committee and parents were in attendance on the 11 Mar 16 for the Squadron annual presentation evening at the Broad Street Methodist Church, Spalding. Our new Junior Cadet intake were enrolled officially into the Air Training Corps, the many achievements of cadets were recognised as their individual certificates and awards were handed out, the big part of the evening came when the Squadron made its awards known. The Squadron was pleased and honoured that Aaron Heading, United Kingdom Olympian in Clay Shooting was able to come to present some of the awards. For pictures of the event please follow the Link. Parents please feel free to save copies for yourselves. During the week of the October half term 2015 I completed a course to achieve an ILM level 3 in leadership and management. 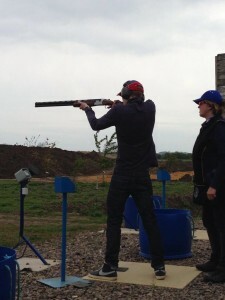 The course was held at Quantock Lodge in Somerset. Cadets from all corps all across the country attended making a total of roughly 50 of us. The week was primarily made up of both leadership theory lessons and leadership exercises. At the beginning of the week we were broken down into multiple little teams which would be our groups for the week. We then spent the afternoon being introduced to the course and starting our theory lessons. We spent the morning of the next day completing some small leadership tasks to practice our skills in command and find out what we needed to work on before our assessments. 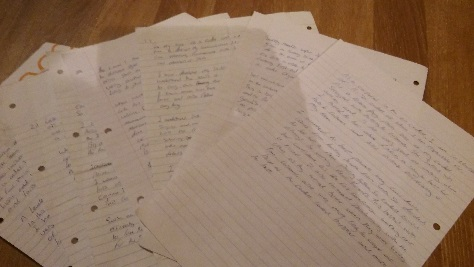 We then spent the afternoon and evening in lessons and beginning our coursework. The third day was our practical leadership assessments. We had each been given a one hour long exercise which we would lead. We had planned it the evening before and were now being assessed on how we led the team to complete the exercise. My exercise involved building a raft in order to then go and diffuse as bomb on the other side of the lake. It had two parts which I had to be aware of. First, the raft building itself, I had to make sure my raft was strong enough to make multiple trips across the lake. Second, the bomb, the bomb had 3 parts which had to be moved in a certain sequence in order to not set off the bomb. Once I had built my raft and worked out the sequence I decided to tie a long rope onto the front and back of the raft so that people could stand on each bank and pull the raft, this way it would move faster than being paddled. Using this technique I successfully completed my exercise. 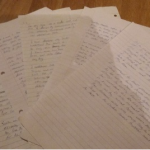 The final day, and the next few weeks after purely involved writing up our essays for our coursework which had to be handed in for assessment in early November. I have since received my result of a pass and can now say I hold an ILM level 3 in leadership and management. The whole course was a great experience as It gave me the chance to make friends in other corps and other parts of the country, it also gave me a broad knowledge on the subject of leadership which I hope to be able to pass on to the cadets on my squadron. 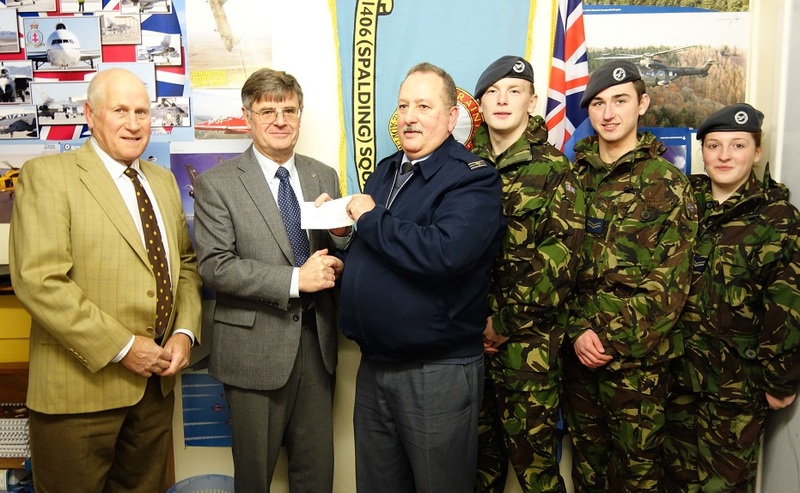 On the 9th February, Flight Lieutenant Rogers, Corporal’s Mika and Bertolaso attended the Spalding Rotary Club presentation evening to collect their donation to our Squadron from money which was raised with their help in December. Various local clubs and charities attended the event from the area who had also helped out with the Santa Sleigh collection in December. The money which we were presented will go towards increasing the Squadron opportunities with equipment for DofE activities and a new flight simulator which we are hoping to build, all of which so that the cadets can do more. A huge thank you to the Rotary Club for allowing us to take part in the Santa Sleigh collection and inviting us to the presentation evening, it was a fantastic evening and great to meet everyone who makes these fundraisers possible. Band Badges but no Band?! 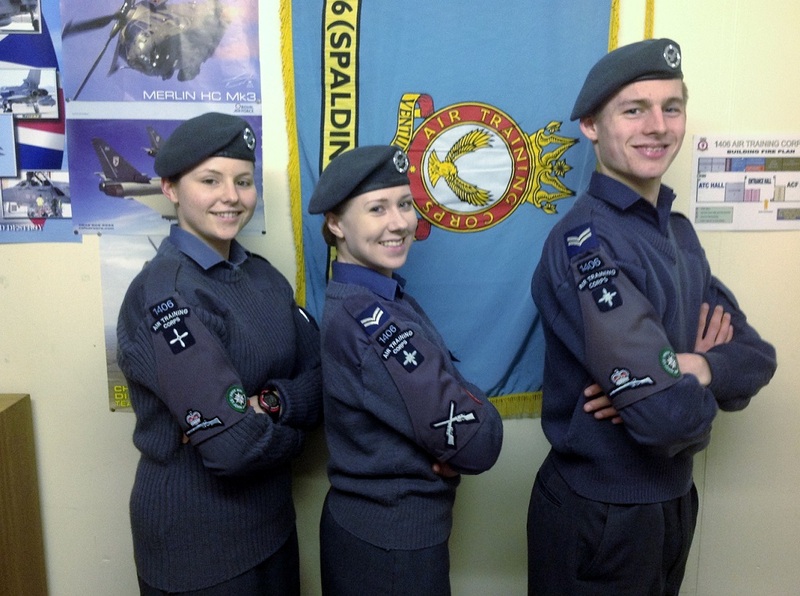 Four cadets from 1406 Squadron Air Training Corps (ATC) Spalding achieved almost the impossible recently – they received their “Band Badges” when the squadron does not actually have a band! 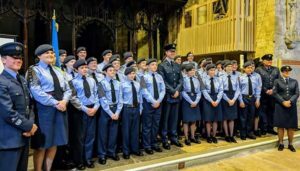 Through their own study, hard work, musical interest and obviously some talent they went were assessed by Wg Cdr Gil Singleton the Principal Director of Music, for Headquarters Air Cadets and awarded their cadet band badges for their musical performances. 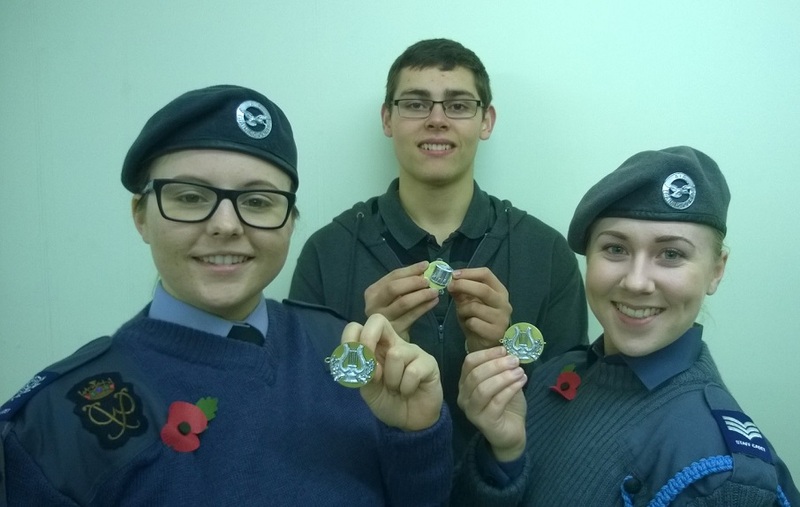 CWO (Cadet Warrant Officer) Maria Lockie (picture left), Cdt Sgt Heather Stacey (picture right) Cdt Cpl Stephen Wilson, (picture rear) and Cdt Luke Campbell (not pictured) showing their well deserved badges. 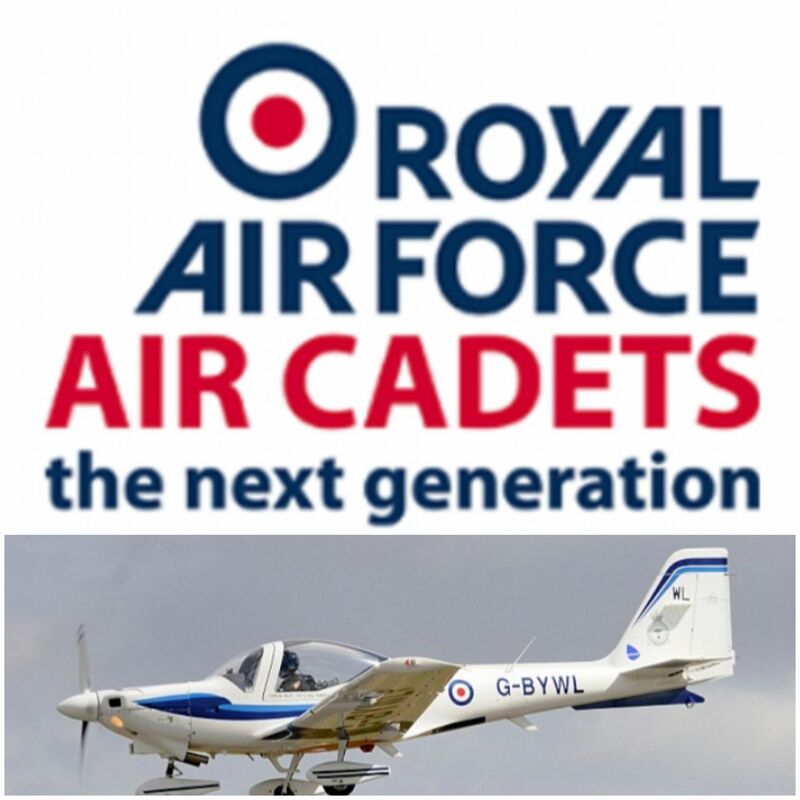 The Wg Cdr was so impressed that he has asked Cdt Sgt Heather Stacey if she would like to be a “cadet solo act” as part of the musical arrangements he is working on for the Air Cadet 75th Anniversary event to be held at RAF Cranwell next August. The event is a singular honour for any cadet to be present, let alone to be performing as a solo act, and will mean Heather will be singing and playing in front of a crowd of over 3000 including VIPs!! The squadron is very proud of their effort and that they have been duly rewarded with their badges, plus we hope that Cdt Sgt Stacey continues to show her musical talent. 1406 Squadron Air Training Corps (ATC) Spalding’s own CWO (Cadet Warrant Officer) Lockie and Adult Sgt Navarrete took park in the National Inter Services First Aid Competition this month. 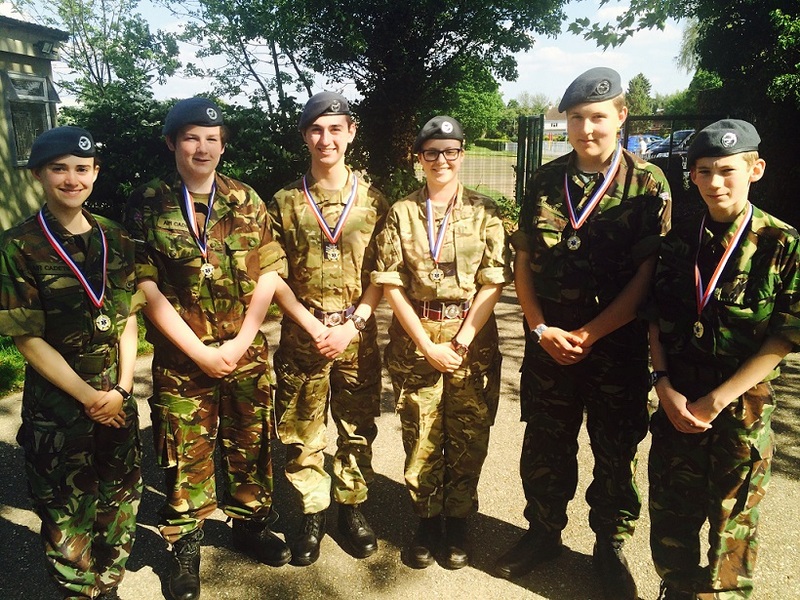 The Young Adult team came a fantastic Second to the National ACF (Army Cadet Force) Champions from Durham ACF. The National Inter Services First Aid Competition is an annual event, placing together teams from voluntary organisations such as St John, the cadet forces ACF (Army Cadet Force), ATC, CCF (Combined Cadet Force), Sea Cadets and Marine Cadets, as well as other organisations such as the Police Cadets. The ATC Wing has supported this event for over ten years, providing casualties, judges and support in various ways, it has also previously competed at this National Level well throughout the past years, but this year was a great result plus a first for Spalding squadron. 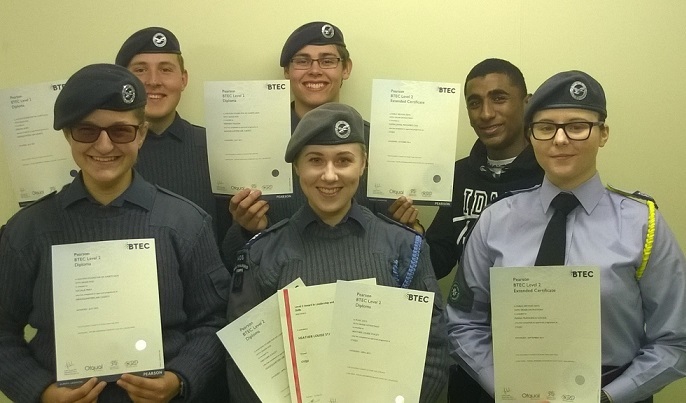 The cadets of 1406 Squadron Air Training Corps (ATC) Spalding were have been celebrating their success in completing their BTEC Certificates. Awarded via the CVQO, in the case of the BTEC Level 2 Diploma in Aviation Studies a cadet will take a number of years to complete the required study and exams in various subjects, such as Air Navigation, Military Air Systems, Piston Engine Propulsion, Air Power and Principles of Airframes, to name just a few to qualify to wear their Master Cadet badge. The cadets can also choose at the age of 16 years to take on a self learning package which takes a year for either the BTEC Level 2 Diploma in Music or BTEC Level 2 Diploma in Public Services. The photo is just a few of the cadets who have done really well, Cdt Sgt Avery, Cdt Cpl Sandford (not pictured), Cdt’s Mika and Wilson all successfully completed their BTEC Level 2 Diploma in Aviation Studies. 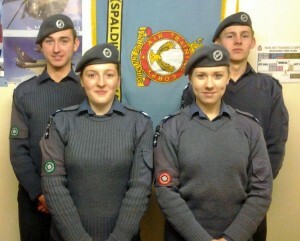 Cdt Sgt Cali (picture rear right) completed the BTEC Level 2 Extended Certificate in Public Services with Distinction. While Cdt Warrant Officer Lockie (front right) was awarded the BTEC Level 2 Extended Certificate in Public Services with Distinction Star plus the BTEC Level 2 Diploma in Aviation Studies. A squadron first, we congratulate Cdt Sgt Stacey, (pictured middle front) who was not only awarded the BTEC Level 2 Diploma in Music with Distinction Star, plus the BTEC Level 2 Diploma in Aviation Studies but as a result of her qualifying as an Aerospace Instructor Cadet (signified by the blue lanyard) and completing the required study, she has also been awarded the ILM (Institute of Leadership and Management) Level 2 Certificate in Leadership and Team Skills (Cadet). Well done Sgt Stacey and everyone else for their hard work and well deserved awards. 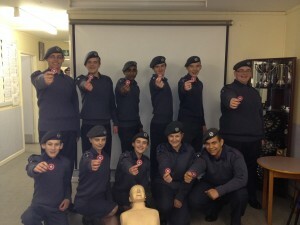 1406 Squadron Air Training Corps (ATC) Spalding’s own CWO Lockie and Adult Sgt Navarrete took part in the Air Cadets Corps Young Adult First Aid Competition this month. The team had great success and came 2nd by one mark overall and have now advanced to the inter-services first aid competition which is in a few weeks. 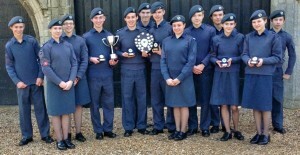 The 115 Sqn youth team also came 3rd overall which was a great achievement. Medals were awarded by Air Commodore Dawn McCafferty, Commandant of the Air Training Corps. The cadets of 1406 Squadron Air Training Corps (ATC) Spalding were pleased to take place in the Battle of Britain 75th Anniversary Parade in Peterborough this month. The cadets formed with other squadrons and paraded around Peterborough city centre, along with a contingent of RAF personnel from RAF Wittering, local RAFA, Veterans and Standard Bearers from each organisation present. The parade was reviewed in Cathedral Square, Peterborough, with local dignitaries and a fly past by Spitfire, Hurricane and Dakota aircraft from the Battle of Britain Memorial Flight, RAF Coningsby. The veterans and everyone eventually went into St John’s cathedral for a service of memorial and remembrance. Eleven cadets from 1406 squadron ATC (Spalding) went to see the Red Arrows on Wednesday 26th August 2015 at RAF Scampton. We got to sit inside the training Red Arrow, which doesn’t go up into the air till needed. It also had all the safety guards on so we could take our phones in to the plane and take photos of the aircraft. They showed us around the cockpit and where the coloured dye comes from, before we went outside to watch the pilots come out and get into their planes, do the pre-flight checks, then we saw the Red Arrows form up and take off. Once the Red Arrows went, we went back into the hanger and had a little look around in and took some more photos. CWO Lockie attended a field day run for all the IACE cadets in the A Group visiting England at Beds and Cambs Wing HQ on the 2nd August. The group of around 40 IACE cadets from Ghana, Canada, America, Belgium, Turkey, Germany, China, and Korea were helped by ten Cadet Warrant Officer’s and Cadet Flight Sergeant’s from the Wing on the day. Being one of the current Wing Young Adult First Aid Champions she helped out with the First Aid Exercise and as a thank you was invited to RAF Wyton to the formal dinner held for the IACE cadets to celebrate their last night in Cambridgeshire. 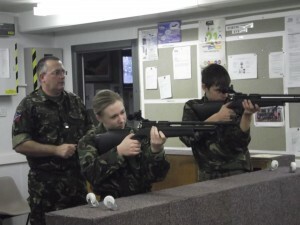 1406 Sqn was able to put in two teams of “marksmen” forward for the Air Cadet Trophy this year, the competition is a postal shoot with several “shoots” which the team members must complete using Air Rifles against ring targets – the inner circle or “bull” being awarded the most points. Both teams have done extremely well and are to be congratulated on our first entry into competition! 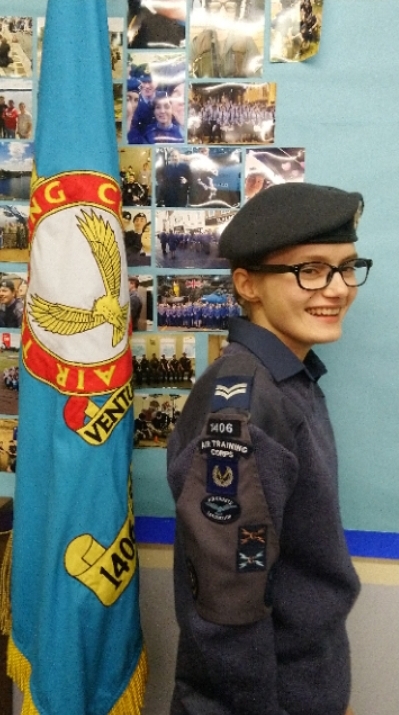 Cdt Natalie Mika has been selected to be a member of the Wing Media Team – her new role is the “Social Media Expert” and her duties have already started. 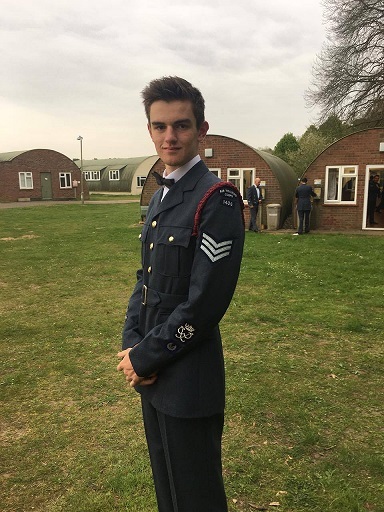 The Wing Media Officer needed help so he came up with the idea of a team of cadets who would provide support to him in several different media roles; the call went out to all the squadrons in the Wing and Cdt Mika was lucky enough to get selected. 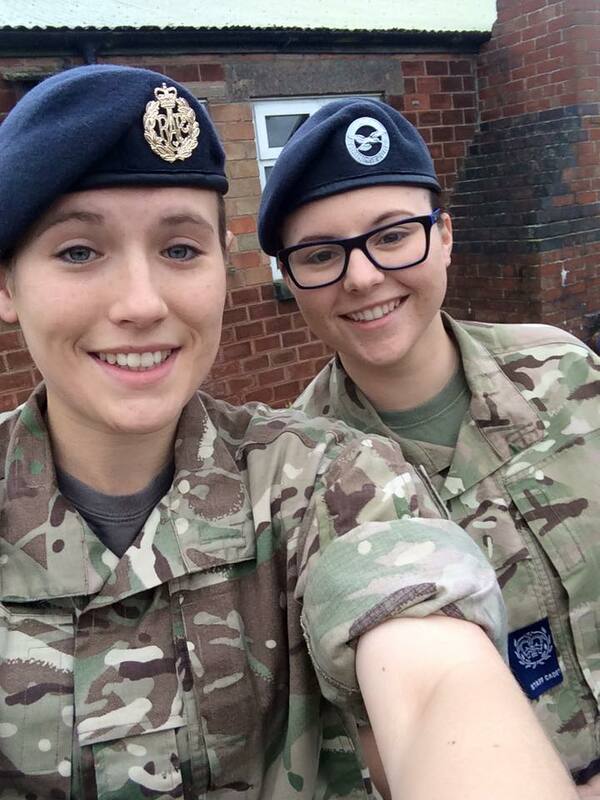 Cdt Mika’s new role is to ensure that Tweet’s from Squadrons are re-tweeted, tweet Facebook content from Wing and Squadrons. She’s to share Facebook content from Squadrons with Wing while checking media content. This is a significant and responsible role and we wish Cdt Mika all the best as she steps up to fill the role. 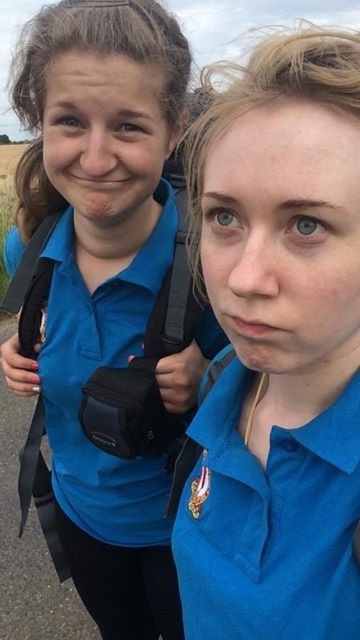 Three Cadets from 1406 Sqn Air Training Corps (ATC) Spalding recently embarked on their final expedition and completed their Bronze Duke Of Edinburgh’s Award. 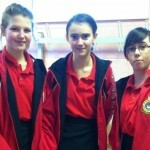 Cdt Sgt Heather Stacey, Cdt Cpl Ruth Sandford and Cdt Natalie Mika, set off on a Saturday morning. Once dropped off at their first checkpoint they only had a total of 14 checkpoints and 16 hours of walking over two days to complete their expedition requirement! The cadets braved the hardships on day one of hot weather and foot problems during a gruelling schedule which was followed by a night under canvas being rudely woken up at 3am in the morning by a group of “spooked” peacocks, and the second days walking to the finish line, to a well earned success. 1406 Sqn Air Training Corps (Spalding) has had a change of President to their Civilian Committee. 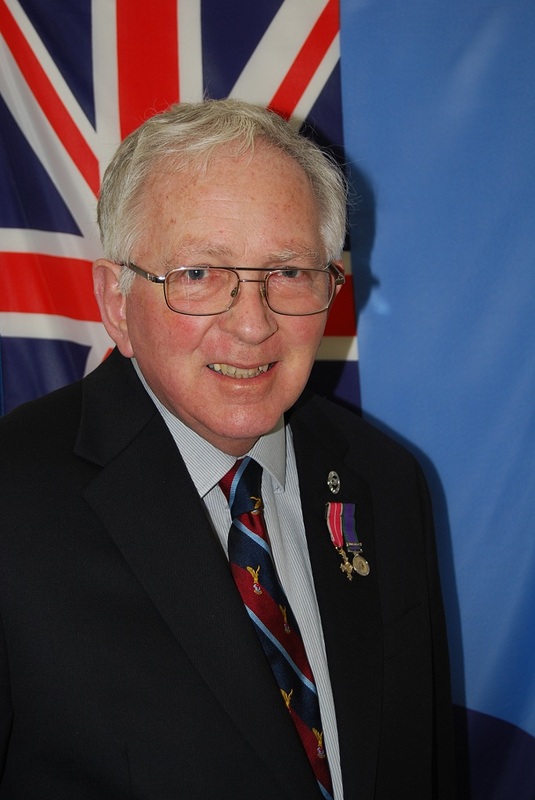 The out going President Air Commodore Nick Carter OBE MA RAF (Retd) has been in post for over 12 years having served for 32 years before retiring from HQ Logistics Command, RAF Brampton in 1994, but is sadly stepping down due to ill health. 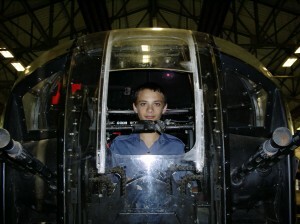 Wing Commander Josh Fortune RAF is taking up the post. 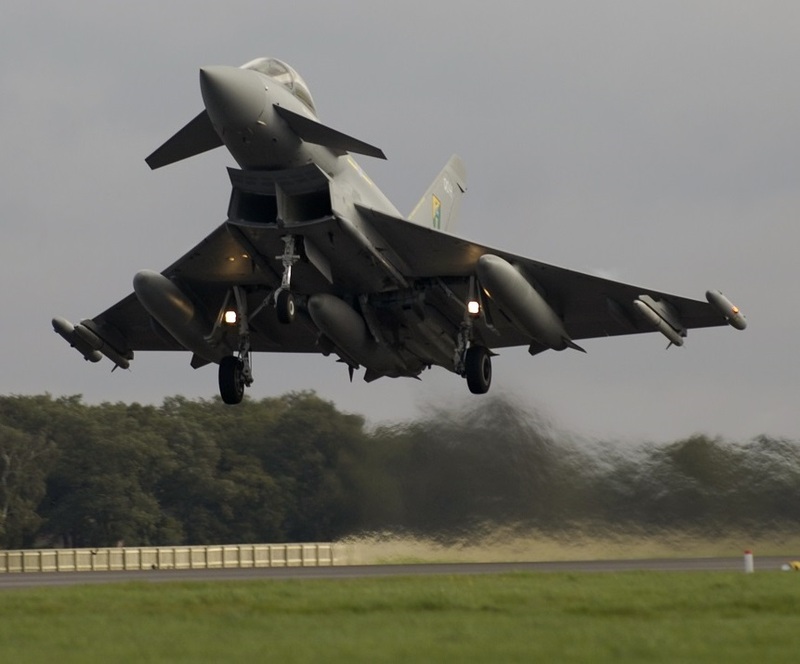 Josh commissioned into the Royal Air Force Engineer branch in April 2002 and has spent much of his career working with the RAF Tornado aircraft in the F3 and GR4 variants. He also undertook the Joint Service EOD course qualifying as a Conventional Munitions Disposal Officer and even served in the Falklands for a whole year. He has impressively also been the Senior Engineer Officer for the Royal Air Force Aerobatics Team – The Red Arrows. 1406 Sqn ATC, the staff, committee and cadets all bid a fond fair well, get well soon and thank you to Nick before welcoming Josh as the experienced addition to the Civilian Committee he will be for help and advice on Service matters. The squadron has also to say a big thank you but hopefully not farewell to Mrs Jo Nell who also stood down; she has been the Civilian Committee Treasurer since 2007 and a member of the Civilian Committee since 2003. Both her daughter Lucy, and son Charles, were active members of the squadron. 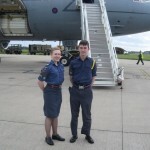 Charles has since joined the RAF as a pilot and Lucy is currently a Medical Bursar studying at Leeds University. Jo and her husband both take a keen interest in orienteering and help out with transporting cadets to various events, both orienteering and inter-wing sports. We wish her well in all she does. Some of the cadets of 1406 Squadron Air Training Corps (ATC) were pleased to take place in their first major ATC Clay Pigeon Shooting Competition this month. The team had a great day with individuals taking part doing really well. The whole team gets their Wing Blue for competing at this level, but Cpl Avery and Plt Off Bone both went on to be selected for the ATC Teams (Cadet and Staff) in the Inter Service Flush final. Cpl Avery was awarded a Corps Blue and his team came Second, Plt Off Bone and the Staff Team went on to win their competition. 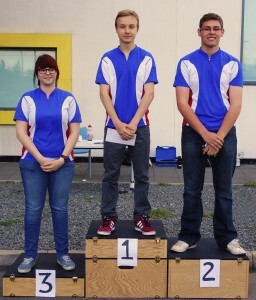 Spalding Air Cadets from 1406 Squadron and fellow Holbeach Air Cadets from 2430 Squadron took all three podium places at the Lincoln Orienteering Groups 2015 Spring Series staged at the University of Lincoln on the 28th May. 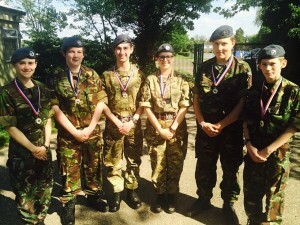 The cadets took part in all six of the Series events on the evenings during April and May at different locations in Lincolnshire, the cadets competed for the Short Course Trophy; their scores for each event being aggregated to give the final results. 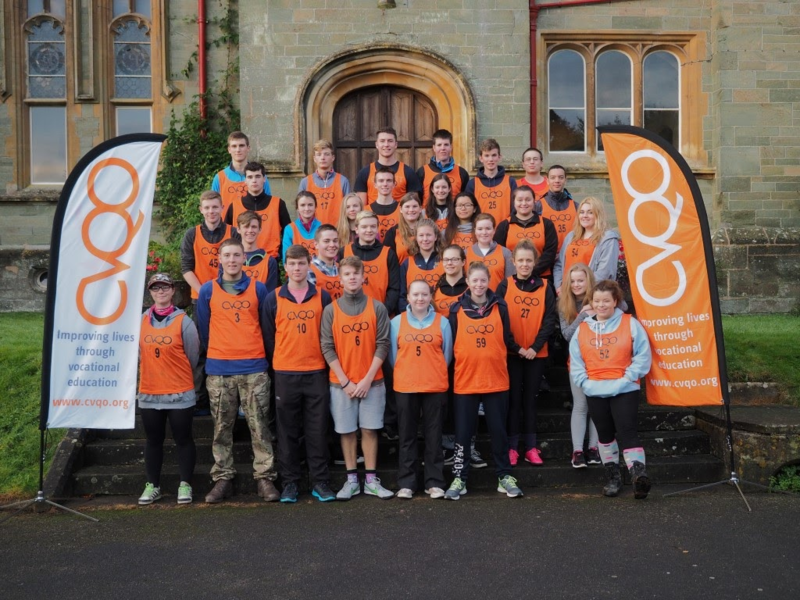 1406 Squadron has always had a strong history of cadets participating in Orienteering; they find the outdoor adventure sport, involving route-finding with map and compass between control points offers both a mental and physical challenge which they enjoy. Pictured are from L to R: CWO Maria Lockie, 1406 (Spalding) Sqn; Cdt Max Crowley, 2430 (Holbeach) Sqn; Cdt Stephen Wilson, 1406 (Spalding) Sqn. New Recruits Evening – Ready for Take-off! Who: If you are between 12 (year 8) and 17 years of age – please bring a parent or guardian with you on the evening. Wing Athletics 2nd Place success! 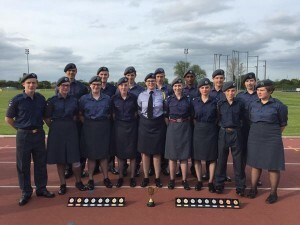 The cadets of 1406 Squadron Air Training Corps (ATC) were pleased to take place in the Wing Athletics event in Bedford this month. The team had a great day with individuals taking part in numerous events and getting medals. Team members who deserve a mention are Cdt Dan Cushen Cdt Cameron Patterson, Cdt Abigail Vaus, Cpl Conner Phillips and Sgt Heather Stacey, all of whom had personal success in one or more events on the day. Together the team managed to top the Junior Boys category and win 1st place and place Second in the overall competition on the day, once again a great team effort and we congratulate them all. 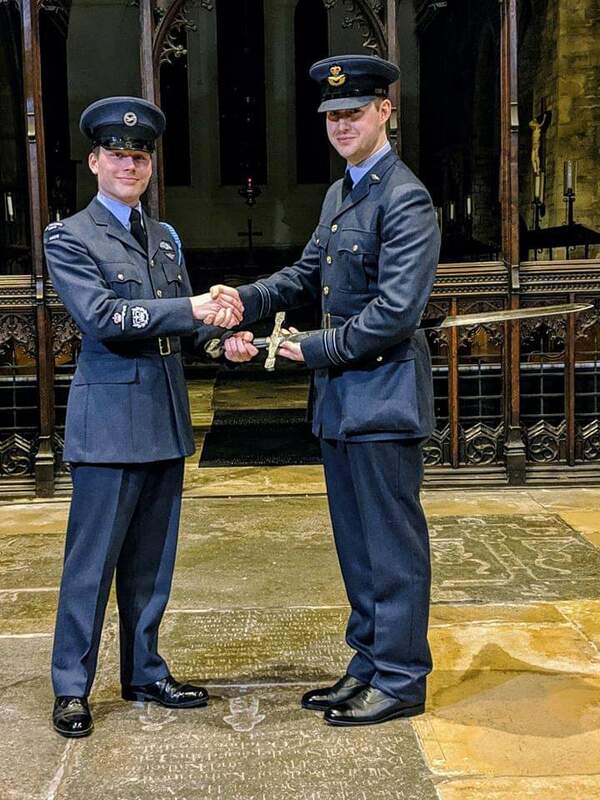 We’d like to congratulate an say well done to Chris, no longer Warrant Officer Chris Bone of 1406 Sqn ATC (Spalding), now Pilot Officer Chris Bone VR(T). Recently Chris took his commissioning board interview, followed by Officer training at RAF Cranwell and passed, we are proud to have him back at his new rank. 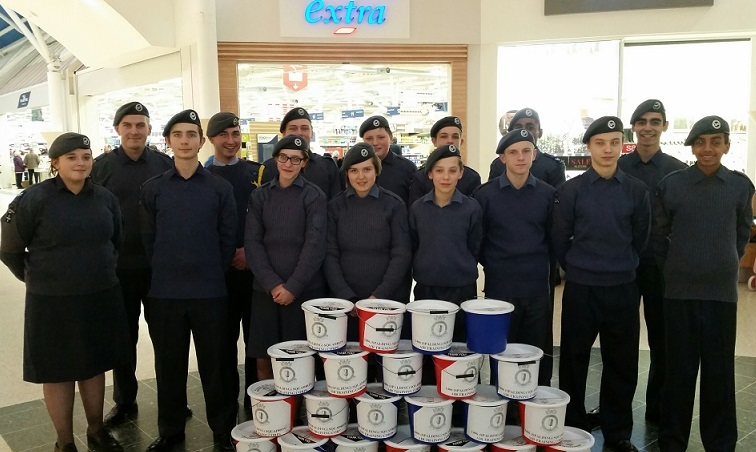 Twenty Spalding and five Holbeach cadets worked together at Peterborough Tesco for a bag pack raising money for both Squadrons and to fund cadets going on the Nijmegan march later this year. The cadets spent all day helping shoppers at the store and raised an amazing £1200 to be split equally. We’d like to thank the store and it’s staff for their help and support and the customers for their amazing generosity. The enthusiastic cadets of 1406 Squadron Air Training Corps (ATC) were surprised to receive a cheque for £700 from Bakkavor representative Terry Moore to purchase a new Squadron Banner. The old Squadron Banner has seen over 20 years of service and represented the squadron at many events but has started to show wear and tear, so desperately needed to be replaced; the gift from Bakkavor is a wonderful help to buy the replacement needed. 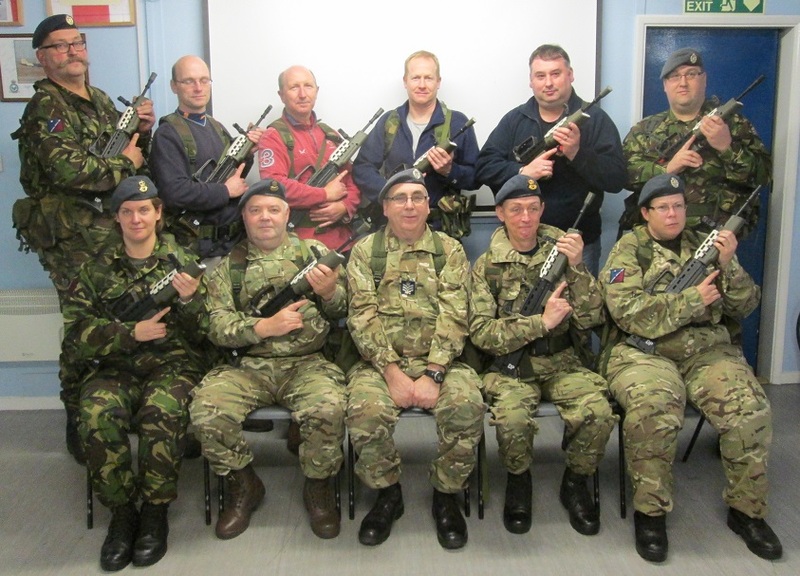 Adult staff from varying squadrons in the wing recently completed a two day “skill at arms” instruction course with the new cadet L98A2 weapon. Although the course was using the drill purpose version of the rifle, the training and final test was given as if using the real weapon so to ensure that the adults are completely safe handling the rifle during drills. 1406 Sqn was represented by CI Jon Hilton, pictured at the rear following successfully passing the end of course test. It is hoped that many of the course participants can now go on to do other ATC courses to increase the number of staff available to help with range practices, teaching safe weapon handling skills at squadron level, and coaching for shooting at long range target competitions. 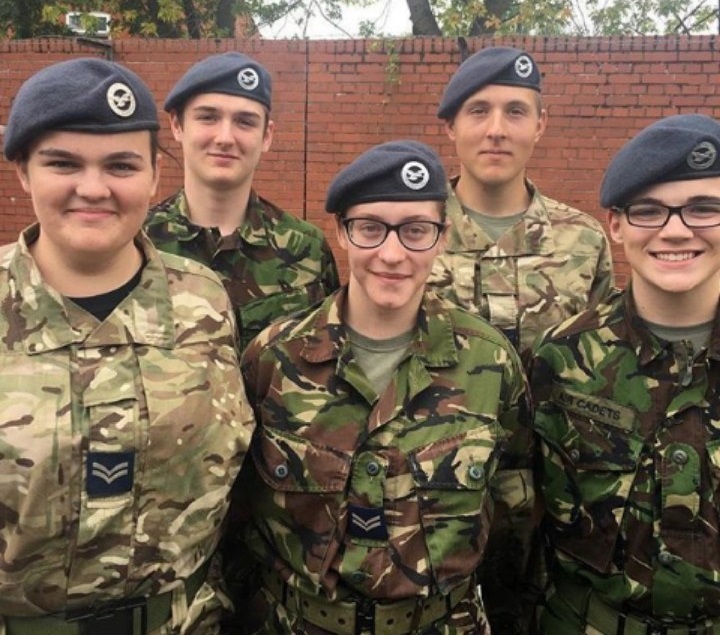 Six cadets of 1406 Squadron Air Training corps (ATC) travelled this month to Beckingham Camp, near RAF Cranwell, the location for the Air Cadet National First Aid Competition in which they were representing our region, Central and East, along with the teams from 5F Northampton Squadron. The competition was held on a Saturday, despite the nervousness suffered by the cadets and this being the first time our cadets had reached the national level for a number of years. On the Saturday night, the results were revealed… our Young Adult Team consisting of FS Lockie and CWO Oxby placed second in their competition (wearing medals in the photo), with 5F placing first and our Youth Team consisting of Cadets Avery, Sharp, Chew and Shields narrowly missing out on medals coming fourth with 5F coming second, so not only did we as a squadron do well, as a region we all did fantastic! This being our cadet’s first national level competition, we were incredibly proud of their achievements before they had even competed! We could not be more proud of what they achieved and the results of their hard work. A number of our cadets have recently took part in the annual wing swimming competition held at the Peterborough regional swimming pool. As always our cadets put in a very good performance with an overall medal total of 5 including 2 Bronze, 2 Silver and 1 Gold, even though this wasn’t quite enough to come away with any of the main trophies for the event the cadets should be justifiably proud of their achievements. It was also a big night for the team manager as he was awarded a promotion to Cadet Warrant Officer in front of the assembled squadrons. A rare achievement for the squadron, its been 12 years since the rank was seen at 1406 Sqn and we congratulate Andy on a well deserved and earned promotion to the highest rank achievable for cadets within the organisation (image above). Wing First Aid teams from 1406 (Spalding) Squadron competed at the Central and East Regional First Aid Competition held within Central and East Region Field Day at RAF Halton on the 7th September 2014. Another successful outcome for both teams saw them both place second in their respective categories, taking them through represent Central and East Region at the Corps competition on the 25th October 2014. The Young Adults team (Cdt Flt Sgt Oxby and Cdt Flt Sgt Lockie) and Youth team (Cdts Avery, Sharp, Shields and Chew) came second to the two teams entered by South East Midlands wing. The top two ranking teams go on to represent Central and East Region at Corps level. Twelve cadets and two staff members from 1406 (Spalding) Squadron recently attended an annual camp hosted by Bedfordshire and Cambridgeshire Wing at Joint Helicopter Command Aldergrove. 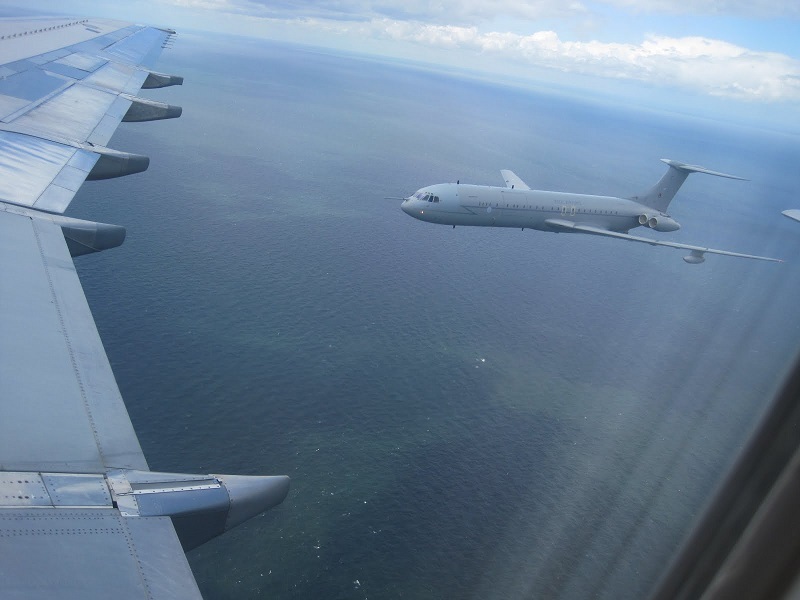 80 cadets and 11 staff members from the wing travelled by coach to Aldergrove in Northern Ireland for a week of activities from the 15th-23rd August 2014. Whilst there the cadets visited different areas of the base such as the photo section, dog section, 5 army air corps, fire section and many others, giving them an insight to military life. The cadets were taken to see some of the local attractions during their stay and managed to receive a guided tour of the Ulster Aviation Society Museum, visit the Ulster Folk and Transport museum and make an impromptu stop at the TruckFest to sit in a Spitfire! All cadets were given the opportunity to undertake a swimming proficiency test, and 1406 came away with 9 cadets gaining their basic certificate – well done! The Squadron welcomed a visit from the Air Commandant, spending the whole evening talking to cadets and staff, observing lessons and preparations for WAT Weekend, before presenting a surprise award to Cdt Cpl David Wait from the St Johns Ambulance as “A young First Aider of the Year” certificate. Wing First Aid Competition 1st Place Winners! The Squadron First Aid Teams competed in the Annual Bedfordshire & Cambridgeshire Wing First Aid Competition at ACF Waterbeach in Cambridge. The young adults team (Cdt Flt Sgt Oxby and Cdt Sgt Lockie) and youth team (Cdts Avery, Ransome, Sharp and Shields) entered and won first place in their categories and received Gold medals on the day and to represent the Wing in the Central & East Regional competition in September. 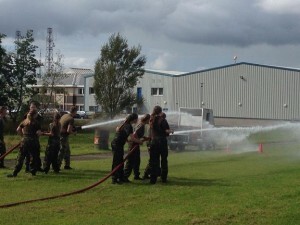 The scenarios would have challenged many professionals, but the squadron training and preparation obviously paid of as the cadets calmly and competently dealt with a dog bite, unconscious casualty with a spinal injury, a second casualty with a fractured femur and finally one with a punctured lung. 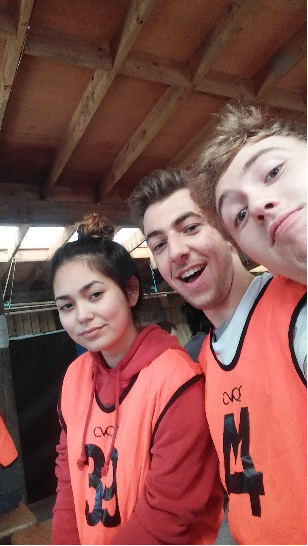 The actors on the day made each simulation with make up and reactions as realistic as possible – the cadets showed great leadership, teamwork, self-confidence and first aid skills! Asda Bag Pack Boosts Sqn Funds! 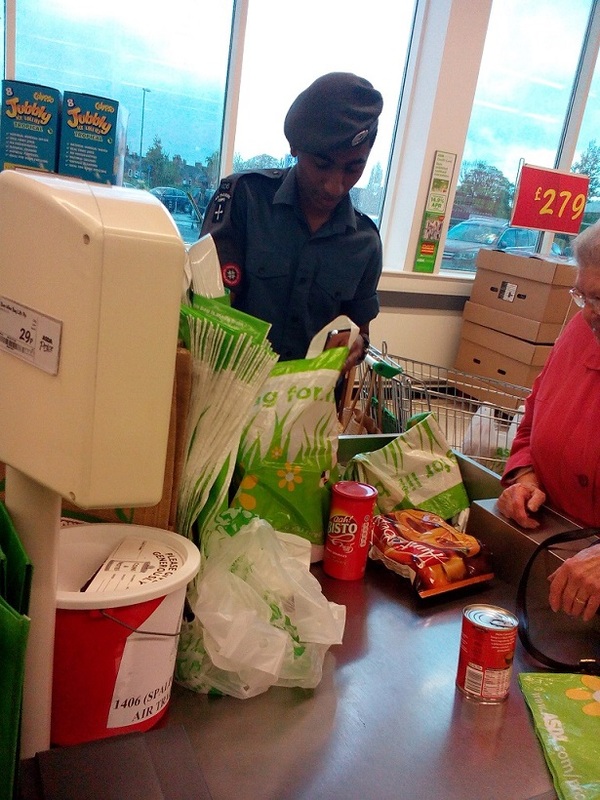 Asda at Boston was the lates t squadron fund raising event where the hard work of the cadets on the day was rewarded by the kind donations of the shoppers! All in all the squadron funds were increased by an amazing £750 – already excellent day meeting and talking to people for the cadets and a well received reward from the shoppers of the Boston area and staff of Asda – a big thank you from us! 1st Overall – Wing Champions two years running! 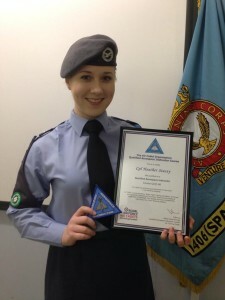 Cadet Sergeant Heather Stacey (17) from Spalding 1406 Sqn Air Training Corps has been awarded a coveted “Blue Lanyard” for qualifying to instruct the Qualified Aerospace Instructors Course (QAIC) which aims to deliver an exciting programme of aerospace related activities for senior cadets. Selection for the QAIC was rigorous. The firstly a paper application by the candidates, with successful applicants attending a selection evaluation weekend, where candidates went through a series of assessments, including a 5 minute presentation, interview, tests on the flight simulator and air traffic simulator, leadership exercises, discussions and an ATC / RAF knowledge quiz, with candidates debriefed on their performance at the conclusion of the weekend. One of the few who successfully completed and now designated as a Qualified Aerospace Instructor (QAI) is allowed to wear the coveted QAI badge and Blue Lanyard when in uniform. Additionally on successful completion of workbooks, she will be awarded a Level 2 ILM Certificate in Team Working and is now qualified to run and instruct in the Regional Activity Centre, such as the one at RAF Cranwell and on the Air Cadet Community Engagement Platforms. As such Cadet Sergeant Stacey should be very proud of her achievement and is truly a serious cadet instructor with some skills! Cadets turn Clay Pigeons to Dust! 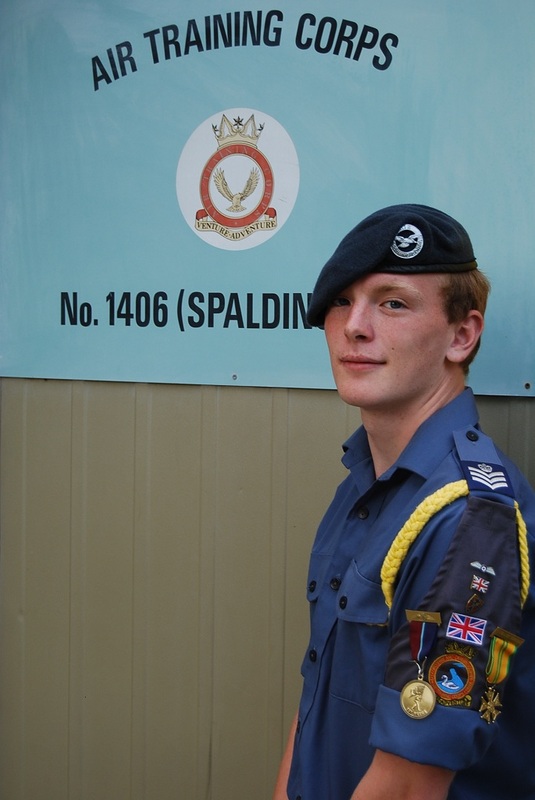 Cadets from 1406 Sqn Air Training Corps (Spalding) took part in two CPSA shotgun skills courses recently and are now ready and raring to demonstrate their target skills! The first half of the CPSA course consisted of Modules 1 and 2 where the cadets learned how to shoot and handle shotguns safely, the second half of the course was less instruction and more practical, where the cadets, once had found their master eye, learned how to shoot clay pigeons! 13 Spalding Air Cadets recently attended a youth first aid course to learn life saving skills which could prove useful in real life. They are now also entitled to wear the red first aid badge. Cdt Emily Ransome said “I really enjoyed learning new skills on this course and it’s even better that they could come in useful in everyday life”. Courtesy of Spalding Sub-Aqua Club, cadets from the squadron have taken it in turns over the last 18 months to sample the Try-Dive programme at the Castle Sports Complex Swimming Pool. 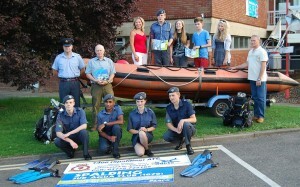 The cadets were taught how to safely assemble the kit as well as dive in safe conditions. 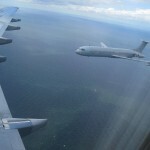 A great new experience not normally one the Air Training Corps is renowned for! 1406 (Spalding) Sqn are now the proud owners of a new minibus, thanks to a grant from the RAF Charitable Trust. The cadets raised over £10,000 themselves over a 12-18 month period, and the Trust grant of £10,400 means they have just taken delivery of the 17-seater vehicle. Various fundraising tasks were undertaken over the past 12-18 months including car park marshalling, packing bags in supermarkets and helping other local charities along the way. The minibus will now be used to transport the cadets to a variety of activities including gliding, flying, Duke of Edinburgh’s Award challenges, camping, orienteering first aid training and more. Having successfully completed all the local training and the 50 mile WARMA qualifying marches at RAF Cosford, 1406 (Spalding) Squadron cadets Flight Sergeant Kevin Kirk and Corporal David Wait were selected to represent Bedfordshire and Cambridgeshire Wing participating in what is probably the most physically demanding event cadets and staff can participate in, the Nijmegen four day marches in Holland or De 4 Daagse, The Walk of the Wold. 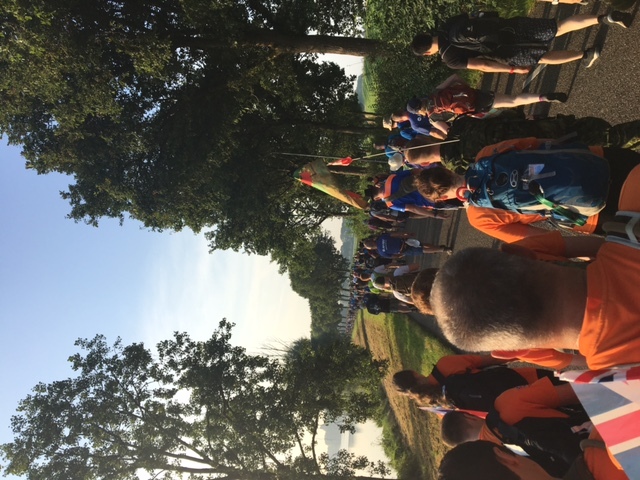 The march covers 100 miles and took place from 16th to 19th July and saw an amazing 46,000 people from across the World take up the challenge. After arriving in Holland the cadets took part in cultural visits and visiting Arnhem cemetery, they also acclimatised in their accommodation at Camp Heumensoord and Malden. 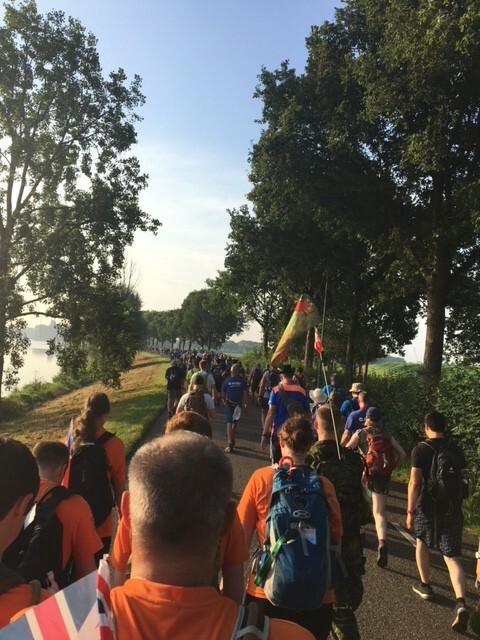 Each day during the march the teams were awake between 2:00 and 4:00am to start marching before the summer sun got too hot. This year the Wing took out 3 teams of cadets, and in total over 40 cadets and staff took part, and all of them finished the march. 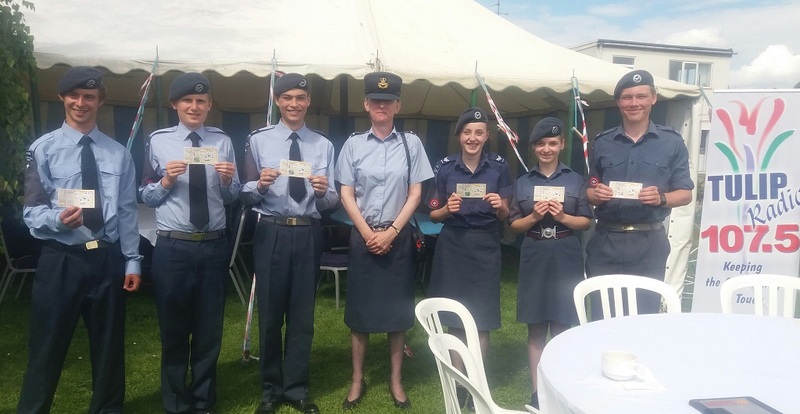 1406 (Spalding) Squadron Air Cadets are celebrating after receiving a generous donation from local International Manufacturer of Fresh prepared foods Bakkavor. The donation was used to provide 6 Vango Mirage 200 tents and 3 cookers, to enable the cadets to take part in the National Duke of Edinburgh’s Award Scheme. The tents will be used for allexpedition training, and together with the cookers provide fantastic opportunities for the cadets to test their leadership and team building skills, as well as testing their resolve when up against all that mother nature can throw at them. Wing Field Competion rising stars plus a medal for one! The Squadron Wing Field Team is shown following their excellent results in the annual event (which included initiative exercises, drill competition and much more) – given the teams efforts this year, we have every confidence in them, they can expect to be higher up the overall rankings in future! 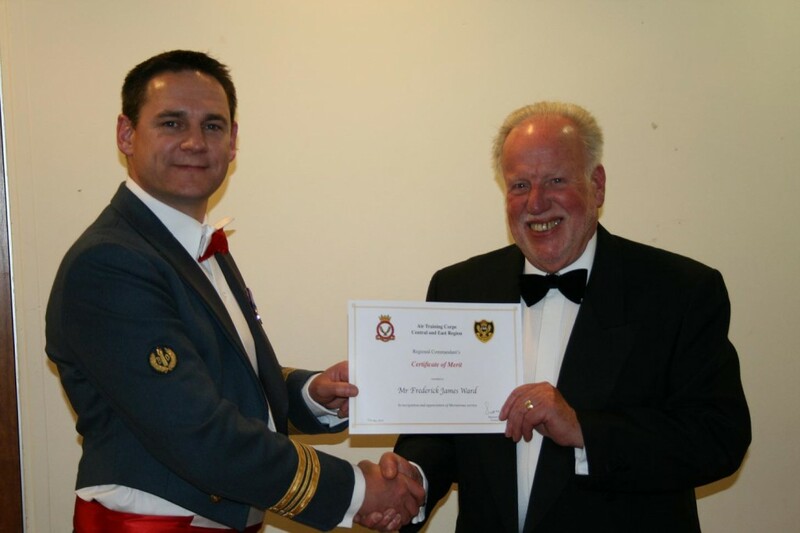 Fg Off Bone is seen here receiving the CFM (Cadet Forces Medal) for completing 12 years of service from the reviewing officer Group Captain Geoff Hewett RAF VR(T), Regional Commandant Central and East Region. Two 1406 (Spalding) Cadets joined in the celebrations to mark Her Majesty the Queens Official Birthday on Saturday 15 June 2013. 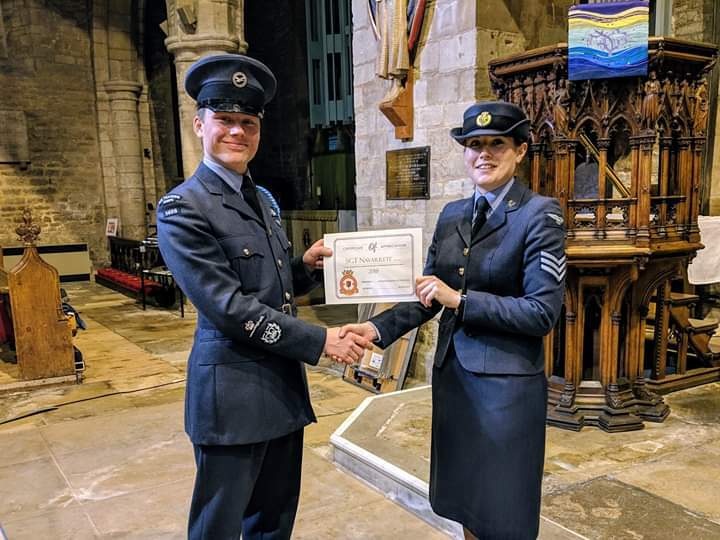 Cadet Sergeant Andrew Oxby and Cadet Corporal Heather Stacey joined forces with the Royal Air Force and took part in the Official Flypast to celebrate the occasion. 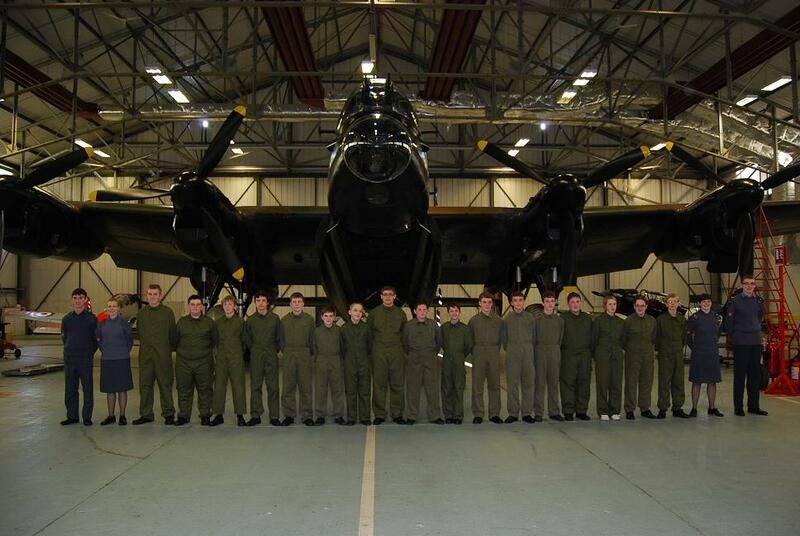 They flew in the Royal Air Force Tri-Star of 216 Squadron, along with 50 other cadets from around the UK. As Her Majesty returned to Buckingham Palace after enjoying the grand spectacle of Trooping the Colour and Horseguards’ Parade, several thousand feet overhead Andrew and Heather were on-board the Tri-Star aircraft as it took its place along with other aircraft in formation as they flew along the Mall, and over Buckingham Palace. The fly-past comprised 30 aircraft of 12 different types from the famous Lancaster bomber of the RAF Memorial Flight to modern multi-role Typhoon fighters, the Red Arrows Aerobatic Team and the RAF’s latest and largest transport aircraft, Voyager, including a Nimrod flanked by two Tornado F3 fighters. The flypast took nine months to plan due to the different aircraft speeds. Due to high winds the schedule was slightly changed as it was decided to withdraw the Spitfire and Hurricane from the flypast. 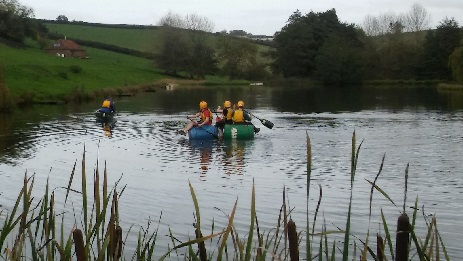 Thirteen cadets and 5 staff from 1406 (Spalding) Squadron made the most of the good weather at the weekend when they practiced their navigation, camp craft and expedition skills in view of the beautiful Derbyshire Town of Bakewell. Cadets were tasked with various navigation tasks that included accurate measuring if distance, compass and map bearings, Identifying land marks, and what to do in emergencies. Also taught and put into practice over the weekend were their cooking skills, with some menus not for the faint hearted! The cadets will now go on to complete their practice and assessed Expeditions later this year, and hoping for more of the same weather. Three cadets from 1406 (Spalding) squadron represented Bedfordshire and Cambridgeshire Wing at the Central and East Region annual athletics competition held in Leicester on the 2nd June. 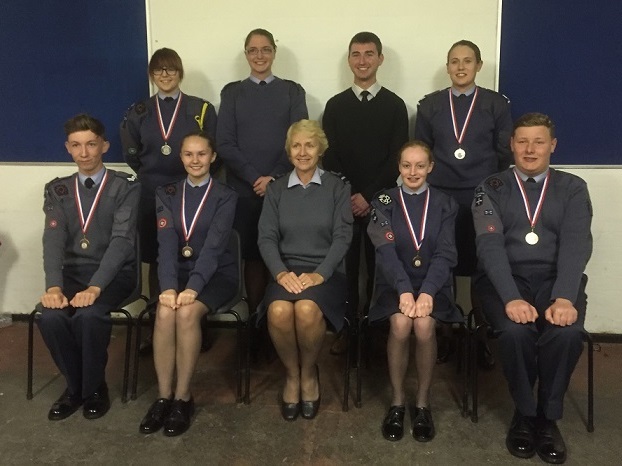 Cadets Emily Ransome, Ruth Sandford and Joe Campbell-Wharam were chosen to represent the Wing following their success at the Inter-Squadron event last month. Cadet Emily Ransome saw herself taking part in the 300m, and then the 4x100m relay and 5x400m relay. She gained a respectable 4th in the 300m, and 5th in the 5x400m relay. Unfortunately, the Junior Girls team had a gold medal in their grasp in the relays only to be told that the team had been disqualified for an infringement at a changeover. Cadet Joe Campbell-Wharam took part in the high jump. Competition was fierce, and despite best efforts could only secure 6th place. 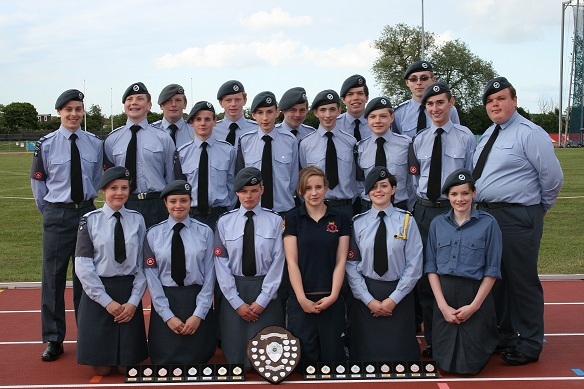 Sunday 12th May saw twenty Air Cadets from 1406 (Spalding) Squadron make the relatively short trip to Bedford International Athletics Stadium for the annual Bedfordshire and Cambridgeshire Wing athletics competition. 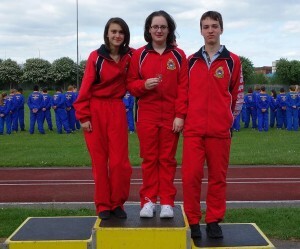 The cadets competed in a range of events ranging from 100m on the track to high jump on the field. High spirits were definitely required on the day as the rain set in for the afternoon, but it did not dampen spirits, moral or motivation from all the cadets, and their sheer determination and resilience throughout the day was outstanding. 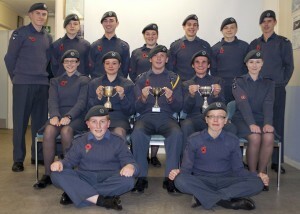 Despite some tough competition the Squadron was able to come home with a large haul of medals and trophies! Three of these were gold earned by Cadets Steve Wilson (Shot put junior Boys), Emily Ransome (300m) and Ruth Sandford (Shot put, both Junior Girls). All three now go on to represent the Wing next month at the Inter Wing Competition to be held at Leicester Stadium. The final surprises of the day for the Squadron were yet to come, when the final results were announced. The Squadron was rewarded for their hard work with the announcement they were Winners of the Junior Girls and Overall Girls Shields! If that was not enough to be going home with, the final accolade came when the Squadron were crowned as the Overall Athletics Champions for Bedfordshire and Cambridgeshire Wing of 2013. The look of surprise on the cadets and Squadron Staff alike was priceless. 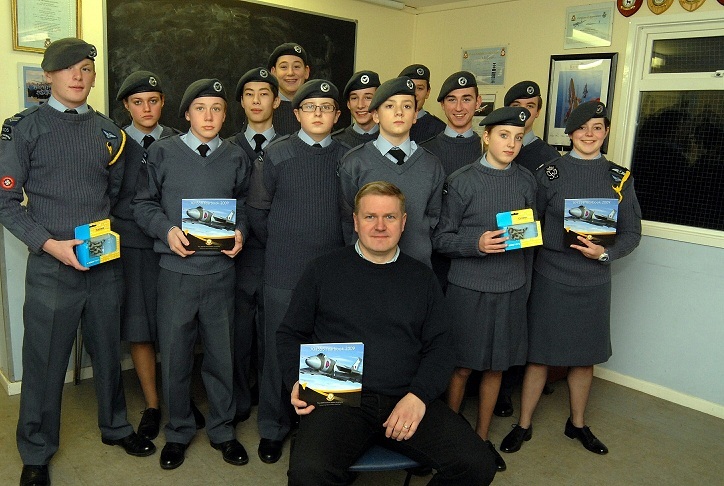 A special night of farewells took place at 1406 (Spalding) Squadron ATC recently. 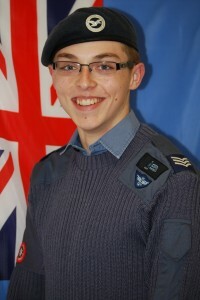 Cadet Sergeant Steven Barnett left the Squadron after almost 5 years to join the Royal Air Force as an ICT technician. The Squadron presented Steven with a card and small memento to remember the Squadron by, and hopefully find useful when he embarks on his initial basic training at RAF Halton, before moving onto RAF Cosford for a year of specialist trade training. Steven finished the evening by serving cake to all the cadets and staff and said, “Well that was an interesting night! Thanks to everyone for all your messages and luck, it’s definitely been an experience and it is a shame to go, but I can safely say I’m going to miss you “. The same evening saw Flight Sergeant Mike Reynolds leave the Squadon after 7 years to join 51 (Orton) Squadron. Due to the imminent arrival of a new baby, and being closer to home, Mike took the decision to move squadrons so that he could be closer to home in case baby Reynolds decides to make an early appearance. The final farewell saw Wing Commander Paul Bower make his final official visit to the Squadron, before retiring as Wing Commander in April. 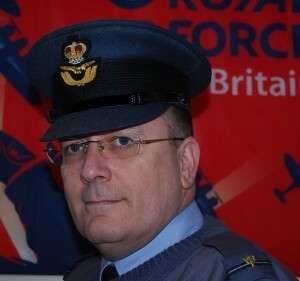 Wing Commander Bower held an open forum session with the cadets before presenting several awards. The air cadets, staff, and Committee wish them all the very best for the future and would like to take this opportunity to thank them all for their support, help and assistance over the years. Three young Air Cadets from 1406 (Spalding) Squadron Air Training Corps were recently in action for Bedfordshire and Cambridgeshire Wing at the Inter Wing Junior netball competition held at RAF Cranwell. 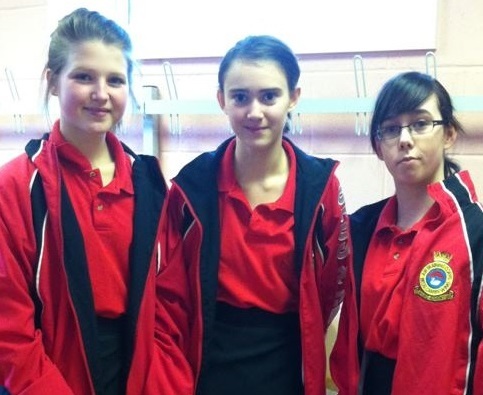 Cadets Emily Brand, Emily Ransome and Megan Aluzzi who have only been with the Squadron for four Months were selected to represent the Wing following the Inter Squadron competition held earlier this year. Despite their young age, all three cadets performed strongly against some very well drilled teams from across the region, and can take away from the competition some valuable experiences for their budding sporting careers within the cadet organisation. 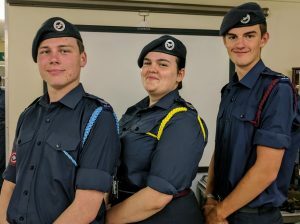 The cadets can be seen proudly showing off their Wing team Colours before later getting presented with their Wing Blues awarded for representing the Wing at this level. 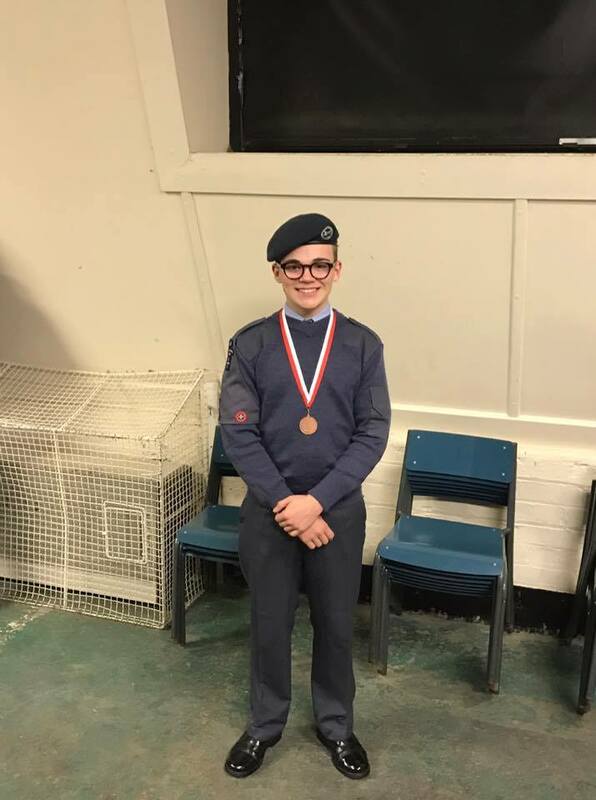 Cadet Corporal Nick Fletcher of 1406 (Spalding) Squadron set his sights high when the Squadron went to Oakington to make use of their fantastic indoor rifle range. Cpl Fletcher had missed out previously on a marksman award of any sort, but the break taken away from shooting to concentrate on his Nijmegen training came up trumps. Using his skills and determination saw Cpl Fletcher score the Squadrons highest result of the day with 500 out of a possible 600. That score also saw Cpl Fletcher achieve a well-deserved Regional Marksman award, the second achieved on the Squadron in as many months. 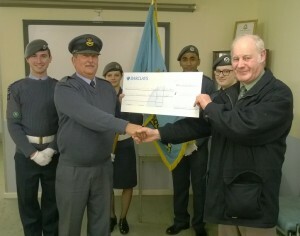 Mr Richard Dobbs and Mr Pat Thomas present their cheque to the CO with cadets present. The cheque is a donation of £1525, which added to the £600 from the Christmas Santa Sleigh collection the cadets helped with brings the total of £2125 gratefully received from The Rotary Club of South Holland towards the replacement of the squadron minibus. 3 Cadets from 1406 (Spalding) Squadron Air Training Corps, battled bitterly cold conditions at the Inter Wing X Country event held at RAF Cranwell on Sunday 10 March 2013. Cadets Emily Brand, Emily Ransome and Cadet Corporal Steven Barnett were selected to represent Bedfordshire and Cambridgeshire Wing. Not only did they have to do battle with the elements, sleet, snow and a biting wind, but also the best X country runners from across the Central and East Region from the remaining 5 Wings. 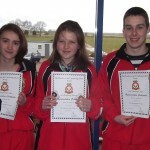 Cadets Emily Brand and Emily Ransome were both in the Junior Girls event. Not daunted by the conditions, the elements or the opposition, the young cadets who have been at the Squadron less than a year, called upon every last ounce of energy, courage and determination to help the Wing team come a creditable and well-earned 3rd place and Bronze medals for all. To add to her medal haul, Emily Brand called upon the crowds support, and used every last piece of energy and effort to come in as 3rd individual, and another Bronze for those efforts, and automatic selection for the Regional team. Emily Brand can now look forward to representing the Region at the Inter region event, again to be held at Cranwell, this time against the best X Country runners from the Air Cadet Organisation from across the UK. Cadet Corporal Steven Barnett represented the Wing at Senior Boys event, in what is likely to be his last event before he leaves the Squadron to join the Royal Air Force this month. 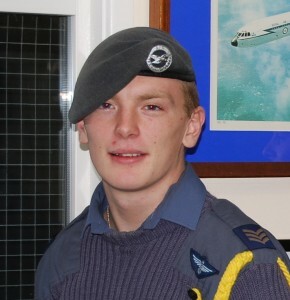 The Squadron wishes him well, and hope that he enjoys his Air Force Career as much as he has his Air Cadet Career. 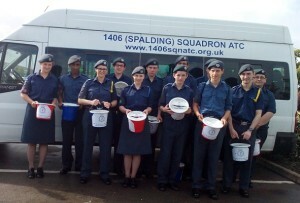 Competition is heating up for the Cadets at 1406 (Spalding) Squadron Air Training Corps. Cadets once again made the short trip to Orton to take part in the Second round of the National indoor Air Rifle Competition. 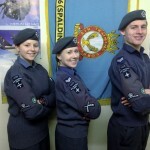 As a result of some fine shooting 3 of the Squadrons cadets can now proudly display 3 Marksman Badges. Cadet Corporal David Wait and Cadet Maria Lockie both achieved Wing Marksman Awards, and Corporal Heather Stacey even surprised herself by achieving the Region Marksman award. The competition is now on to be the first Cadet on the Squadron to achieve the top award of Corps Marksman, something the Squadron has not achieved for many years. A team of 13 cadets from 1406 (Spalding) squadron took part in the wing cross country competition at Hinchingbrooke Country Park. Although we weren’t fortunate to have full teams in all categories everyone did exceptionally well! Cdt Emily Brand was awarded a gold medal for placing individual first in in the junior girl’s category with Cdt Emily Ransome coming second and gaining a silver medal! Our senior boys’ team consisting of Cpl Andrew Oxby, Cpl Steve Barnett and Cpl Nick Fletcher were awarded gold medals for coming first in the team element of the competition, while all three boys teams combined won the overall boys trophy! Cpl Nick Fletcher commented “It was a great day out with the team and even better that we were able to come away with such a range of silverware”. From left: Charlie Palmer, Heather Stacey, Maria Lockie, Andrew Oxby, Steve Barnett, Connor Philips, Nick Fletcher, Milly Beach, Tom Theobald, Korey Young, Emily Ransome, Emily Brand and Aaron Hollis. 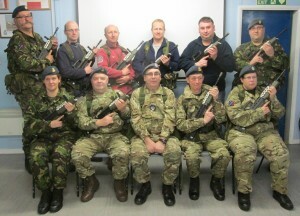 4 Cadet Non Commissioned Officers (NCOs) from 1406 (Spalding) Squadron Air Training Corps recently attended a Cpl-Sgt course held at RAF Henlow by the Wing Training Team from the 8th-10th February. The weekend involved all four of the NCOs being tested on their Corps knowledge and being assessed on their ability to instruct a drill movement of their choice, assess their standard of leadership and their capability in teaching a 15 minute lesson. Over the weekend they were also judged on their standards of self discipline and were inspected both mornings. 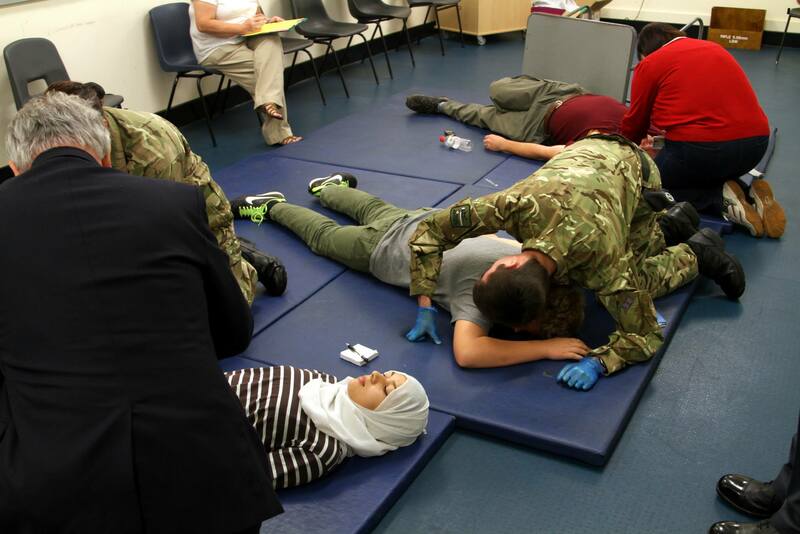 On the weekend 19th and 20th of January 2013, 8 cadets from 1406 Spalding squadron took part in the Wing’s first activity first aid course. The course covers the same syllabus as the first aid at work qualification but allows cadets to teach and assess the youth first aid course also offered by the corps. The course was delivered by the Squadron’s and Wing’s Warrant Officer, WO Bone, consisted of the cadets learning how to dress wounds, treat things such a broken bone, shock and learning how to do CPR, concluded with the cadets being assessed on a number of. Courtesy of an ex cadet….. 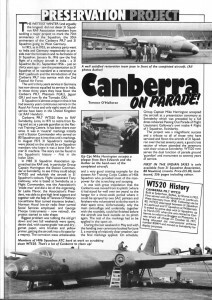 I was looking through some old Flypast magazines and came upon the attached article about sprucing up a display Canberra in the September 1986 edition. The picture at the bottom of the page shows 1406 cadets hard at work scrubbing down the aircraft. 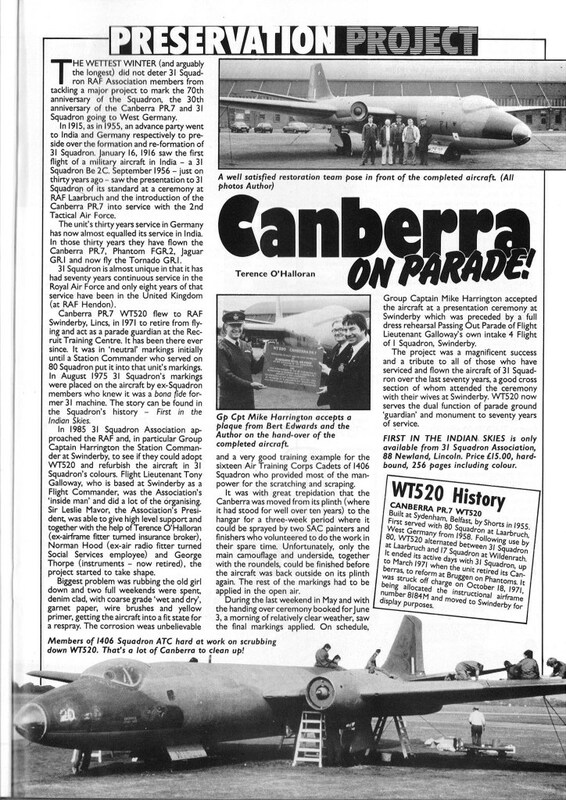 I was tickled to see mention of 1406 as that was my old squadron back in the early 60’s. It prompted me to visit your web site and I was amazed at the changes that have taken place over the years. When I joined the squadron it was based along the river behind the Odeon cinema and had a worn out link trainer and the cockpit of a Supermarine Swift (I think) to play with. Our power flying was in DHC Chipmunks and gliding in T21 Sedbergh’s with trips to RAF Wittering for a look around the cockpit of one of their Victors. Your web site shows a cadet holding a rather fearsome looking modern firearm. We had Lee Enfield 303’s with holes in the breech block for drill purposes and if we went shooting we used to go down the road to the dreaded Army Cadets to use their indoor range and rifles which, I think, were 303’s re-barrelled to take 22 bullets. 1406 comprised of two flights, Spalding and Holbeach which normally only met up for excursions. 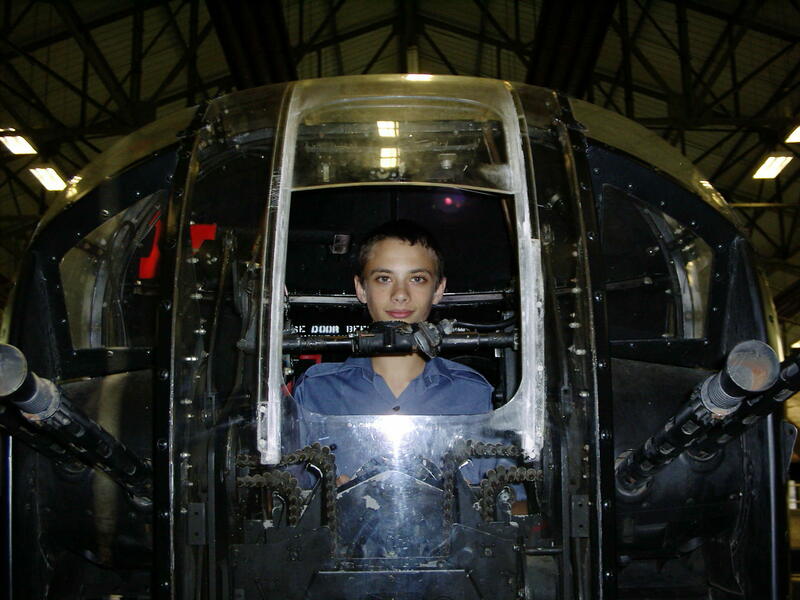 I joined the ATC because of my love of aircraft and flying and when I left the Gleed Boys School my family moved to Bedford and I got a job at The Cranfield College of Aeronautics as a Junior Technician, mainly so that I could work with or close to aircraft. Its been fun reminiscing and good to know 1406 is still going strong and I wish you all well for the future. A small piece of local History was made Saturday 24 November, as 1406 (Spalding) Squadron fired their first ever rounds in the National Cadet Indoor Air Rifle Competition. Spalding Squadron does not have its own range, so cadets and staff made the short journey to Orton to use the indoor Air Rifle Range that Squadron and Wing Warrant Officer Chris Bone helped to install. 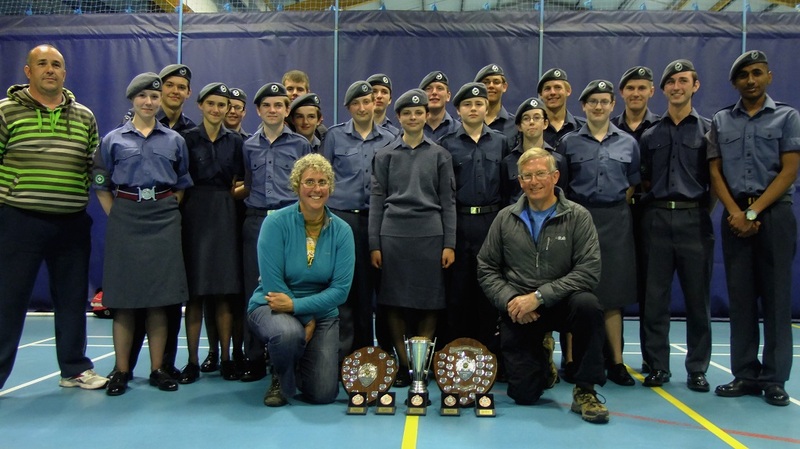 The enthusiastic cadets of 1406 Squadron Air Training Corps (ATC) brought home an impressive haul of trophies from the Cadet National Orienteering Championships held at Warcop training area, Cumbria over the weekend of the 3rd-4th November. Competing against 150 other entrants from Army Cadet Force and Combined Cadet Force units and navigating their way through courses up to 6km in length across tough Pennine terrain, the team won through against stiff competition to bring back the ATC Senior Boys team trophy, the ATC Senior Girls team trophy and the ATC Junior Boys team trophy. Outstanding individual performances by Luke Fortune, Michael and Tom Theobald earned them 1st, 2nd and 4th overall Junior Boys places respectively, showing the high standard these young athletes have achieved. Back, from Left: Connor Phillips, Michael Theobald, Andrew Oxby, Rachel Goodacre, Steven Barnett, Tom Theobald, Nick Fletcher. Seated middle from Left: Maria Lockie, Milly Beach (Senior Girls Team Capt), Kevin Kirk (Senior Boys Team Capt), Luke Fortune (Junior Boys team capt), Heather Stacey. Seated front from Left: Ben Scott, Fred Beach. A Cadet from 1406 Squadron Air Training Corps (ATC) achieved an acclaimed place for the Military Team then completed the historic Nijmegen in July. Cadet Flight Sergeant Kevin Kirk, (from Holbeach), completed the RAFWARMA (a 50 mile over 2 day qualifying march) at RAF Cosford last month, receiving a qualifying medal and team place. The Nijmegan march this year saw over 50,000 people taking part from all over Europe in either 30, 40 or 50 kilometers daily for 4 day courses, participants are mostly civilian, but also a few thousand in military teams; everyone completing their course is awarded a royally approved medal “Vierdaagsekruis”, as worn by Kevin in the picture. 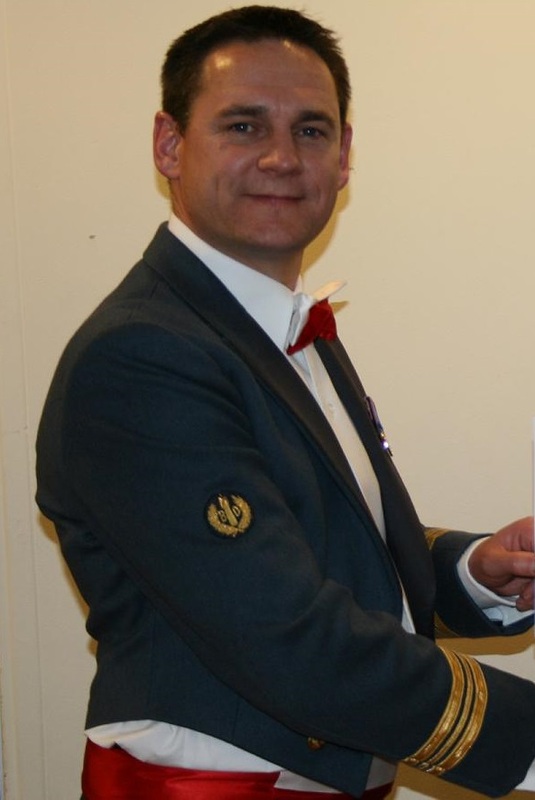 Mr James Ward who recently stepped down from the Civilian Committee of 1406 Squadron Air Training Corps in Spalding has been awarded a Commandants Commendation in recognition of his voulentary work in June. The picture is of him receiving this from Sqn Ldr J Fortune, SengO, 41(R) TES, RAF Coningsby (the newest member of the squadrons Civilian Committee). Mr Ward is regarded as a highly dedicated, motivated and selfless civilian volunteer who has added tremendous value to the young people of South Holland and indeed the Air Training Corps over a sustained period. he filled until Spring 2010, thereafter serving a further year as Vice-Chairman. Throughout his 13-year tenure he used his leadership skills, business acumen and ability to grasp difficult issues in order to bring about positive change, generate income through charity events and always with the primary goal of maximising the Cadet experience. The new enrolled intake of Air Cadets recently included a visit to the Battle of Britain Memorial Flight at RAF Coningsby as part of their training in March. The seventeen cadets and their Cadet NCO Instructors were given a detailed and informative ‘life’ history of each of the aircraft whilst being shown round the hanger. The cadets had chance to look round getting quite close to the historic aircraft as an instructional visit organised as part of their basic training, to help their understanding of Basic Flight and Airfield Operations. A relay team of Air Cadets from 1406 Squadron Air Training Corps (ATC), achieveda highly acclaimed podium place in the Royal Air Force Sprint Orienteering Championships held in February at RAF College, Cranwell. Cadet Sergeant Kevin Kirk (centre) (from Holbeach), with Cadet Luke Fortune (left) (from Gleed Boys School) and Cadet Nick Fletcher (right) (from Moulton Chapel), competed against nine other teams, the majority being serving RAF athletes, many of whom have inter-service competition experience; the cadets powered through to well earned second place, only just behind the winning team from RAF Marham. 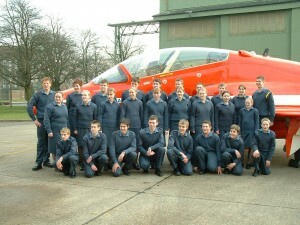 Twenty one Air Cadets of the squadron were given the opportunity to visit the Red Arrows at RAF Scampton this month. Their visit included a talk and videos on the history and how the “Reds” were formed, before a guided tour around the hangar and viewing the cockpit of one of the hawk jets. They then watched the Reds take off and rehearse some of their moves for the new display season, when they had landed they met with the pilots and had photos taken with them. Apart from wanting to just see the Reds and getting to meet the pilots, the cadets gained insight into some of the subjects they study for their ATC cadet qualifications. Jan 2012 saw the visit by one of the pilots of the last remaining flying Vulcan courtesy of the “Vulcan to the Sky Trust”. Kev Rumens a former RAF pilot and one of the pilots who currently display the last flying Vulcan aircraft came to squadron. He discussed his RAF career including serving as a Tornado pilot during the Gulf War and then on display flying of the Vulcan. Cadets and parents were entertained with slide shows and video presentations before getting to ask questions. Picture courtesy of the Spalding Free Press. 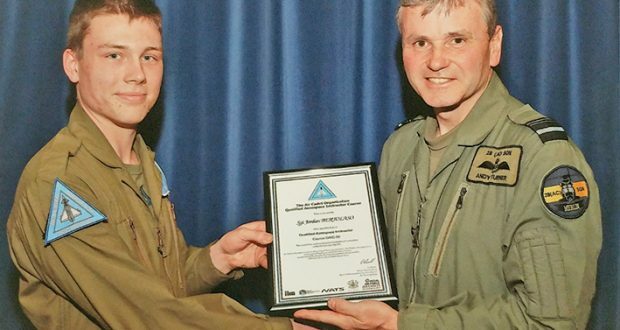 Two Cadets of 1406 Squadron ATC have reached amazing heights of achievement at the same time! Sgt Georgia Davey recently passed the Air Cadet Pilot Training Scheme and Sgt Robert Burchell, passed the Air Cadet Pilot Navigator Training Scheme for the ATC. Sgt Georgia Davey, from Bourne Grammar School, completed practical and ground school training, passed an Air Law exam before completing her solo flying in under 10 hours in a Grob G115D2 Heron light aircraft at Tayside Aviation in Dundee, Scotland to be awarded her Air Cadet Pilot Scheme ‘wings’ plus her flying hours count towards a private pilot’s license. 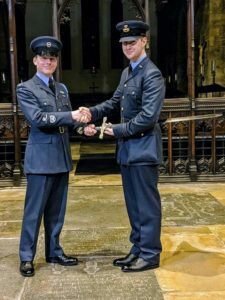 Sgt Robert Birchall, from Spalding Grammar School, completed ground schools, flight planning exercises and 8 hours of flying sorties over the York Moors, Humber and North Lincolnshire in Grob Tutors flying from RAF Church Fenton, North Yorkshire. 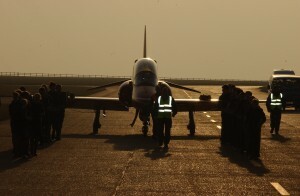 His final planned navigation sortie was to RAF Cranwell, Lincolnshire and back. He passed the course with Distinction to collect his Air Cadet Pilot Navigator Wings, a real achievement. Air Cadets Climb the Rock! The cadets joined about 40 others from two regions including the Bedfordshire and Cambridge Region of the Air Training Corps (ATC) which the squadron belongs to. On top of the usual camp activities, they got to visit working RAF sections including the Fire Section, RAF Police Dog Section and Bomb Disposal Sections. It was not all work and no play, they got to spend time enjoying the sun and sea at the beach nearby, including a boat safari looking for dolphins, a visit to a local water park and theme park, all before taking on the ‘rock – the long walk to the peak of the island! 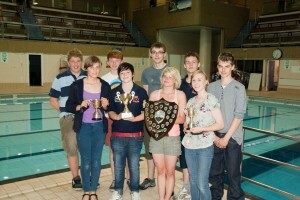 Air Cadets Swim to Success! The cadets of Spalding’s 1406 Air Cadet Squadron, swam to success this month in the Air Training Corps Bedfordshire and Cambridge Wing Swimming Competition! 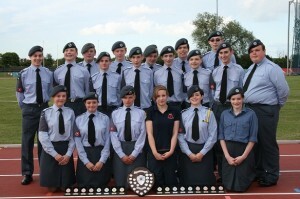 The Wing made up of 29 squadrons of cadets, with the squadron taking overall 1st place. The squadron team managed to secure 2nd Place in the Junior Girls and 1st Place in the Junior Boys Competitions, then with 3rd Place in the Senior Girls Competition the squadron it took commanding 1st Place in the Overall Girls, 1st Place in the Overall Boys Competitions as well. The winners of these races and competitions now get to compete in the Regional Competitions as part of the Wing Teams later this year. 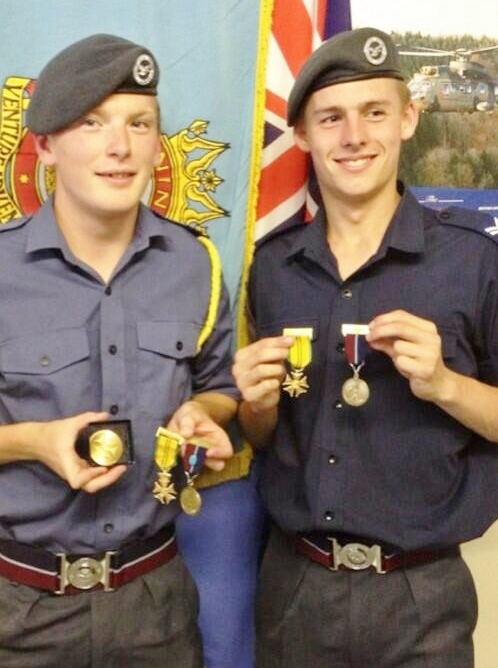 Spalding 1406 Squadron Air Training Corps – Cadet Sergeant’s Georgia Davey from Bourne Grammar School and Kevin Kirk from Spalding, just completed the Lincolnshire Orienteering Group (LOG) summer running season with success after success. Both are seasoned veterans of this active sport, which combines running and map reading skills, in events classed as short, long or technical. Georgia overcame a knee injury at the start of the season to win her group with 249 points out of 250 from six races; she was also part of the squadrons winning girls team, which won ‘by a landslide’. Kevin, who has been competing for 5 years, concentrated on the long courses this season and completed 15 races – his amazing 1000 points total was enough to give him second place on the overall leaders’ board for his group. The Air Training Corps (ATC) Wing Athletics event was held at Bedford International Athletics Stadium on Sunday 8th May and was an inter Squadron competition between all squadrons within Bedfordshire and Cambridgeshire Wing. 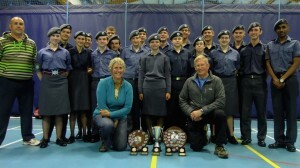 Spalding’s 1406 Squadron ATC Senior female cadet team did particularly well, being presented with the overall point’s trophy. 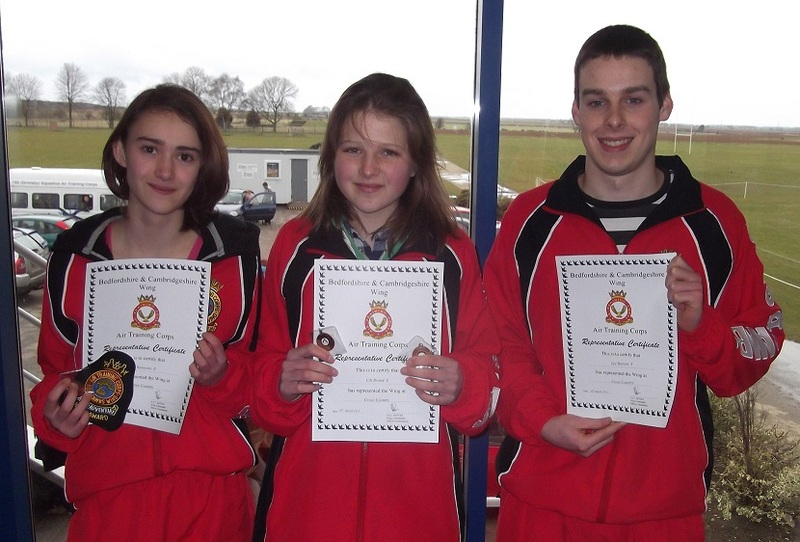 The team also has four cadets who have qualified to represent at the Inter Region Event at Leicester on 22nd May 2011, these are Cadets Hannah McNab and Alex Wright, along with Sergeant Kevin Kirk and Flight Sergeant Sarah Fletcher. 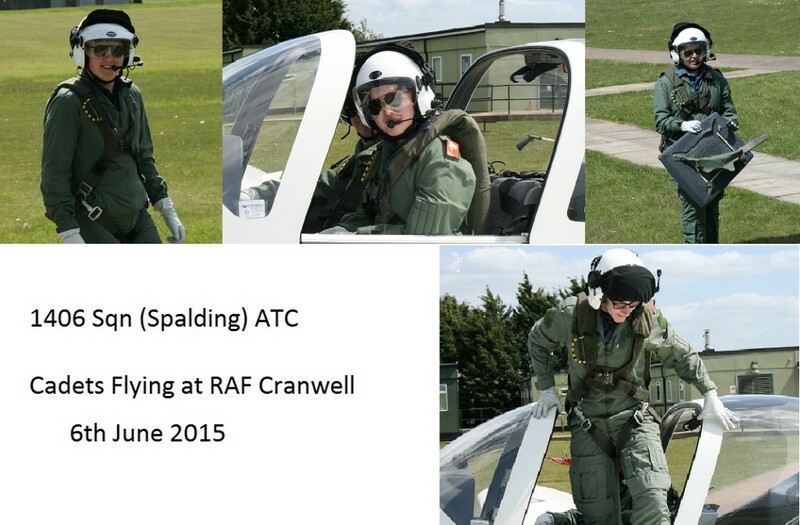 Four Spalding Air Cadets have reached heights of achievement! 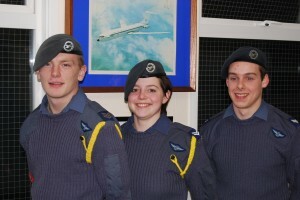 Cpl’s Georgia Davey, Steven Barnett, Robert Burchell and Sgt Kevin Kirk all have been awarded their solo Gliding Silver Pilot Wings from the Air Training Corps (ATC) at 1406 Squadron Spalding. 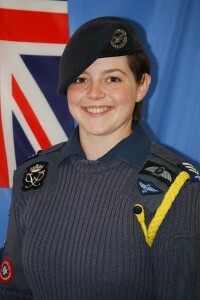 Cpl Georgia Davey, from Bourne Grammar School, went solo in a Vigilant motor glider following 10 hours of training at RAF Henlow, Bedfordshire. She has now also been awarded a place on the Air Cadet Pilot Scheme in Dundee later this year, which will be 25 hours of flight in a Sesna 125 light aircraft – this would count towards a private pilot’s license. Cpl Robert Birchall, from Spalding Grammar School, went solo also in a Vigilant glider, and has now also been awarded a place on the Air Cadet Pilot Navigation Scheme, a course which will allow him to train, plan and fly cross country navigation flight exercises with a pilot. Cpl Steven Barnett, from Boston Grammar School, already a competent glider pilot flying out of Peterborough and Spalding Gliding Club, going solo in a Puchacz aircraft at Peterborough to be awarded his ATC Silver Wings. 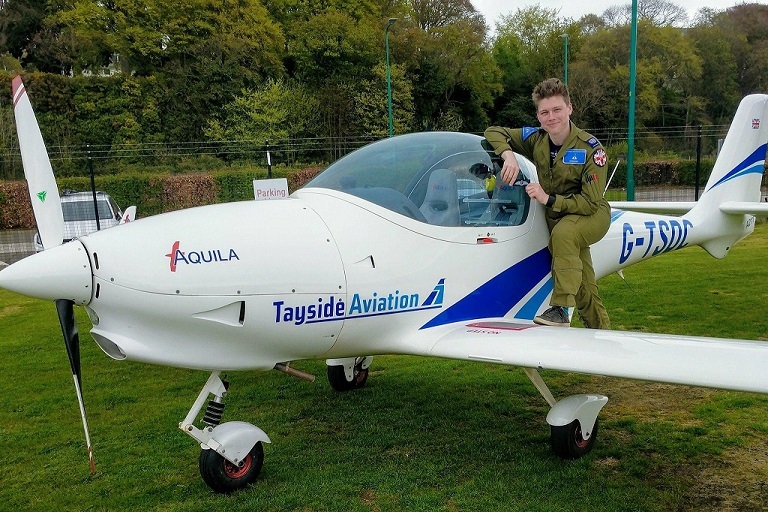 Sgt Kevin Kirk, from George Farmer Technology and Language College, successfully carried out his solo flight also in a Vigilant motor glider after a little over 8 hours flight instruction at RAF Henlow. Come and join Spalding Air cadets and you can do just that. 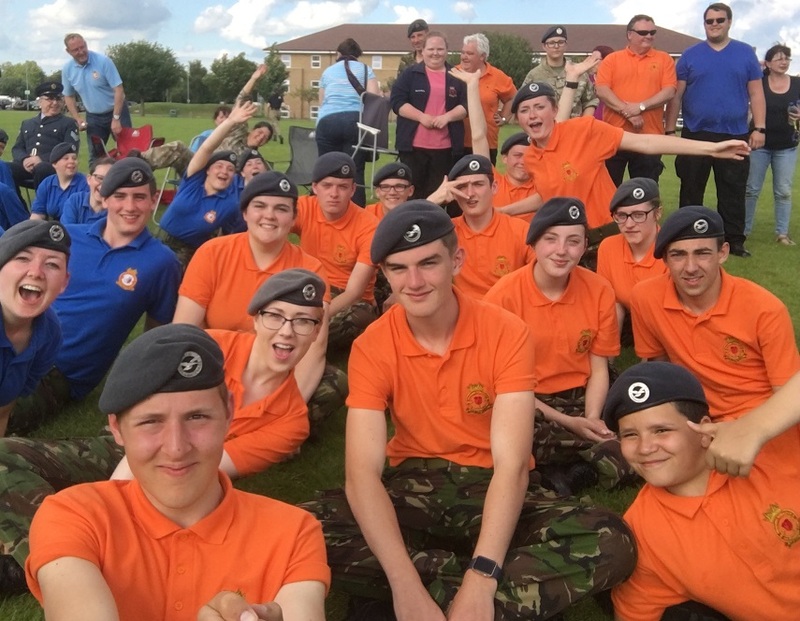 Another summer of activities has drawn to a close and the Air Cadets of Spalding’s own 1406 Squadron have been celebrating as season of success, as they commence their technical training sessions and winter sports activities they are already planning next year’s programmes. 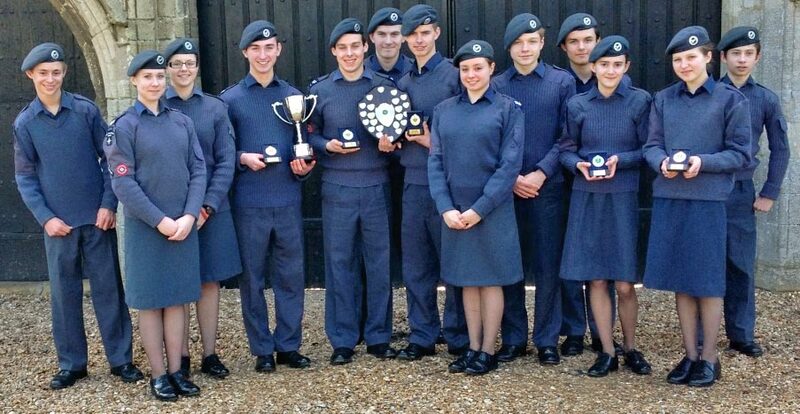 Spalding Air Cadets have literally been flying high all summer with triumphs in their wing swimming and athletics championships and winning the Walker Trophy for being the best squadron on the wing second year in a row. 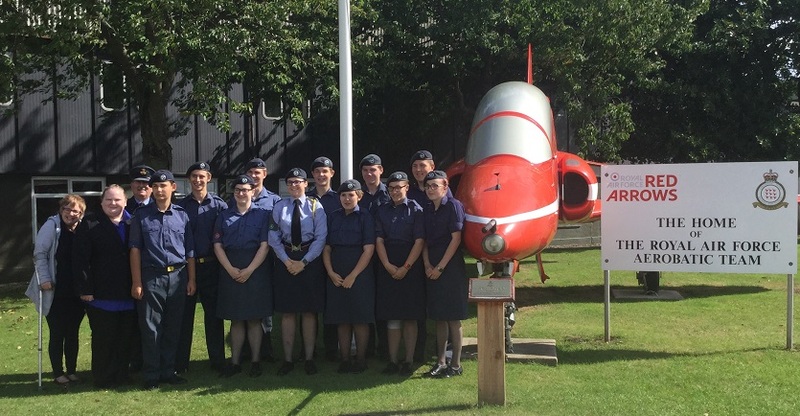 The main summer camp at RAF Valley had a special surprise for one cadet who won a flight in an RAF Hawk fast jet trainer (as flown by the Red Arrows). 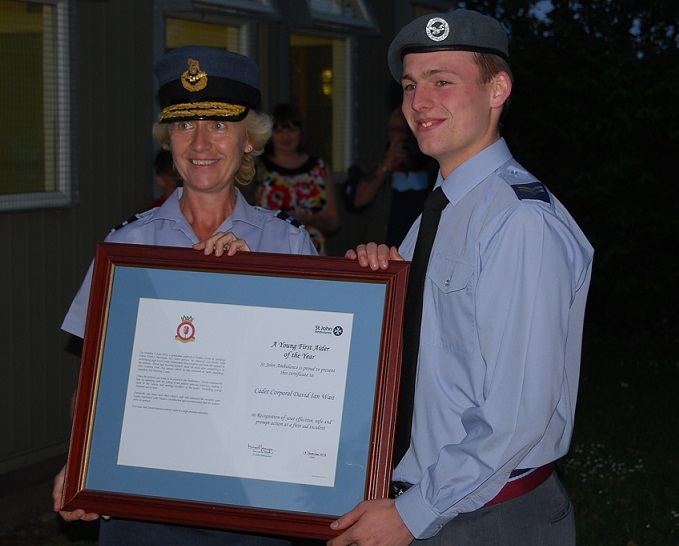 Cadet Sergeant Will Stott, was selected for the flight with 208 Operational Conversion Squadron at no. 4 Flying School, RAF Valley. Will had to under go a stringent medical and training before he was allowed anywhere near the Hawk Jet. Will spent over an hour in the air and took control of the Aircraft for part of the flight, his pilot was one of the squadron’s instructors, and during the sortie they carried out a fly past for local dignitaries and performed aerobatic manoeuvres. Spalding Air Cadets Top Off a Summer of Success by Giving Away £4,500! 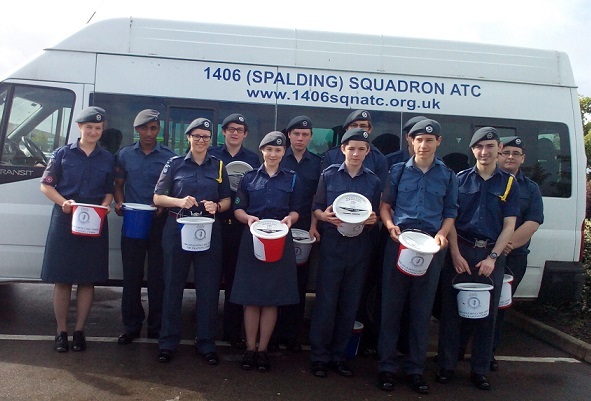 Spalding Air Cadets (1406 Squadron) have had summer of brilliant successes and they topped it all by giving away £4500 to charity. 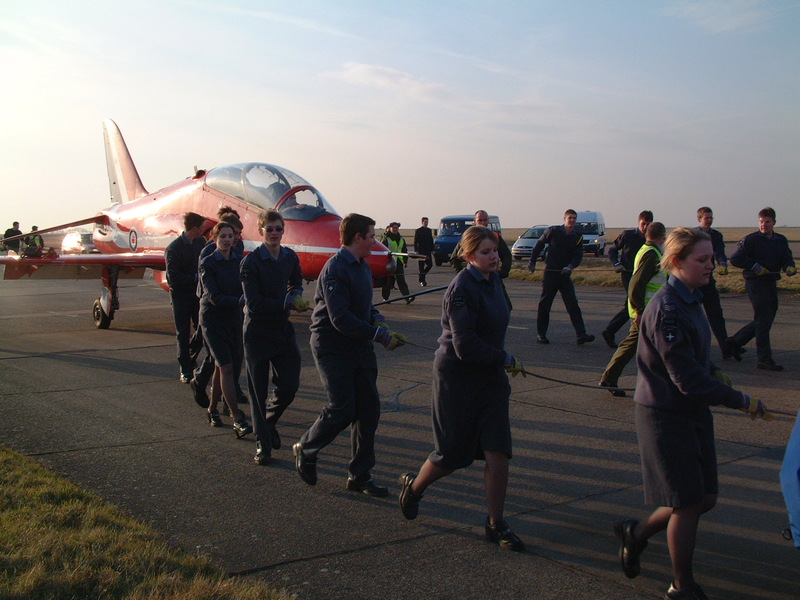 Earlier in the year the Spalding Guardian reported the Cadets tow of a Red Arrows Jet Training aircraft for 1.6 kilometres along the runway at RAF Scampton. The idea was not to replace the RAF’s tow tractors but to raise money for charity. Now the Cadets of 1406 Squadron have made good their pledges to The Lincs & Notts Air Ambulance, The Royal Air Force Association and Newark Air Museum. Representatives from the three charities attended a special evening at the squadron’s HQ in Spalding and each received a cheque for £1,343.70p an total of £4031.10p. 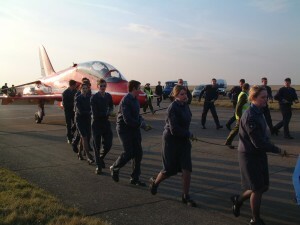 Only 30 of the squadron’s 100 plus cadets raised the money after their day out being entertained by the Red Arrows. 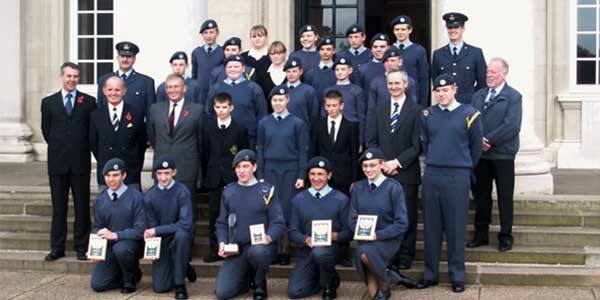 Each cadet received a media disc of pictures and a news video of the day and a souvenir brochure of the Red Arrows. If this was not enough the Squadron gave another £500 pounds to RAFA.